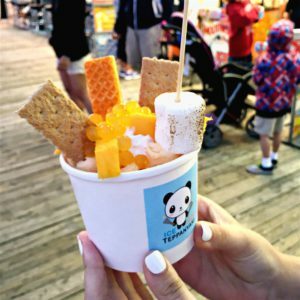 WILDWOODS, N.J. — Beach vacations, done right, have a magical way of getting you to eat, drink and do things you’d normally steer clear of on a regular weekday. Take roller coasters. I hadn’t been on one in years, ever since a wild ride on the Phantom’s Revenge at a Kennywood school picnic left me dizzy for weeks. Yet, there I was under the stars on a recent Tuesday, my knees stuffed under a bar in a seat high above the Atlantic Ocean on The Great White, a rickety beachfront wooden roller coaster on New Jersey’s Wildwoods Boardwalk. After first stuffing myself silly with funnel cakes, mango-flavored teppanyaki ice cream and a cold beer. Biking, boogie-boarding and boating on vacation? Par for the course. But hurtling down a 25-foot drop into a dark tunnel under the boardwalk before creak, creak, creaking 110 feet back up so my daughter and I could plunge, screaming, 100 feet back down toward the ocean? Not in my wheelhouse. Yet something about the ocean air and pulsing energy of this two-mile stretch of the Jersey Shore made me throw caution to the wind. Crazy-crowded and loud once the sun goes down, the boardwalk takes tacky to unrivaled heights with its gaudy souvenir shops, endless pizza stands, and vendors hawking 25-cent games of chance. But that’s what also makes it a hoot. Not to mention a nostalgic dose of old-fashioned kitsch. 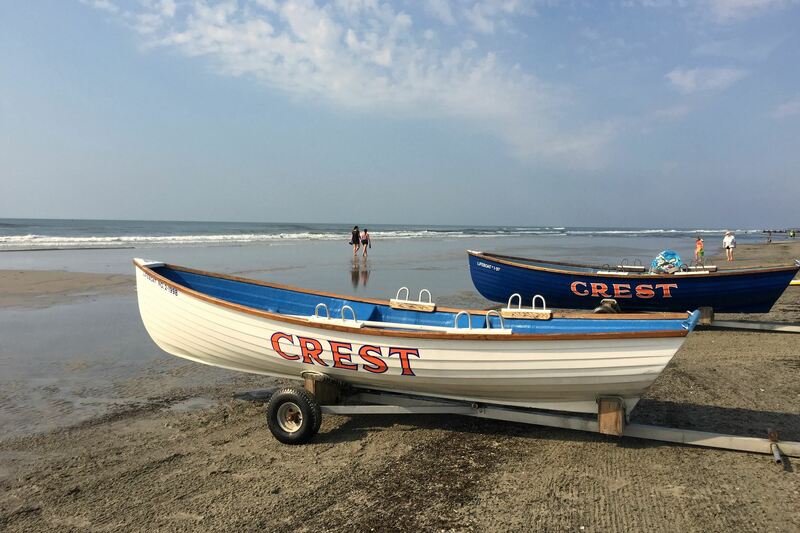 The two-minute coaster ride is a perfect metaphor for the Wildwoods, the collective name for the “sister” beach towns of North Wildwood, Wildwood City and Wildwood Crest at the tip of Southern Jersey. Driving into town, there’s so much activity and so many people. 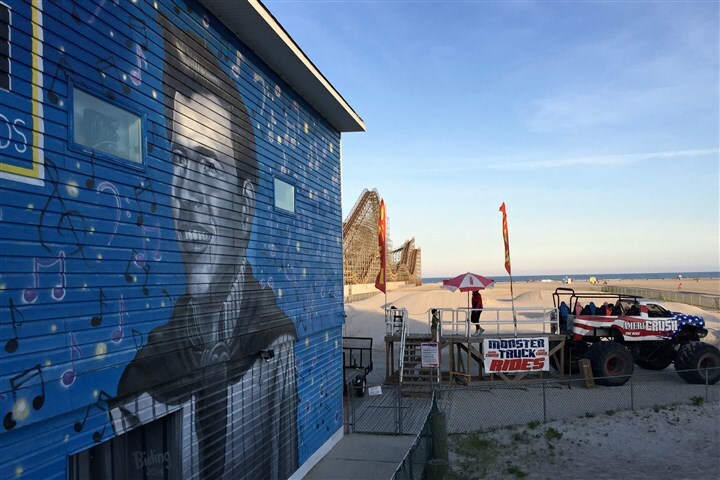 With more than 8 million visitors each summer season, Wildwoods is the most-visited family vacation destination at the Jersey Shore, surpassed only by Atlantic City. And where are the highrise beachfront hotels? But like the Great White, the island grew on me. By the time I left, I was already planning a trip back. Here’s why. 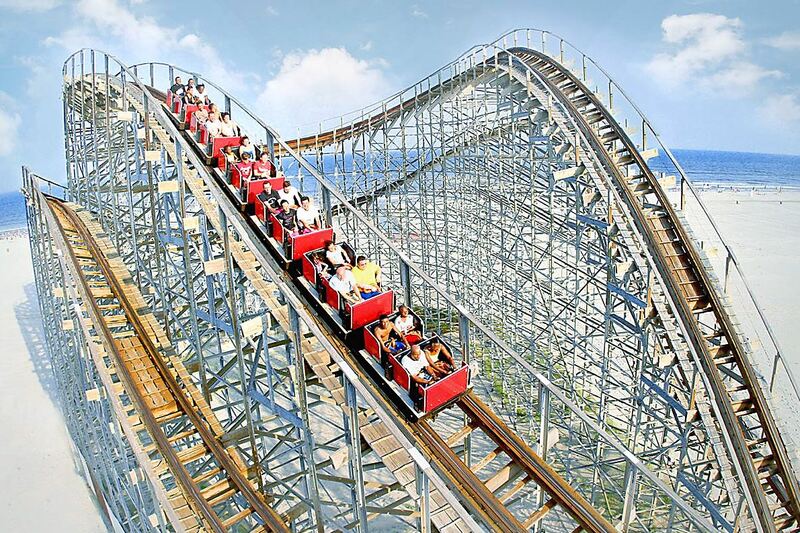 Wildwoods’ beachfront out-and-back wooden roller coaster, The Great White at Morey’s Piers. You can’t help but love the beaches, which are so insanely wide that it takes a good 5 minutes to walk from the boardwalk to the water’s edge. Plus, they’re free. (Although you will have to pay to park; bring plenty of quarters to feed the meters.) The Wildwoods also is a great town for cycling, with a recently expanded bike path, and boasts a handful of museums in which to kill time when it rains, including the working Hereford Inlet Lighthouse, the National Marbles Hall of Fame and a converted ’60s motel devoted to doo-wop. There’s also free fishing and crabbing, free entertainment most summer nights along with Friday night fireworks and some of the coolest architecture on the East Coast. Whereas neighboring Cape May celebrates Victorian design, the Wildwoods lives and breathes doo-wop. During the 1950s and ’60s, brothers Wilbert and William Morey built a small empire of candy-colored motels on the island inspired by the MiMo-style hotels they saw during winter vacations to Miami’s South Beach. They were much smaller, of course, but just as stylized, with playful, futuristic architectural details such as acute angles, delta wings, cantilevered roofs and lots of flashing neon. As tastes changed and beach-goers sought more modern accommodations, many of those buildings fell into disrepair and were demolished. 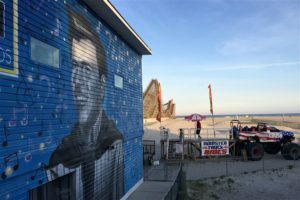 The remaining 96 or so might be gone altogether had a group of business owners and architectural buffs not gotten together in 1997 to form the preservation league, with its mission of keeping the architecture and spirit of doo-wop alive in the Wildwoods. “They realized how cool it was and that it needed to be preserved,” says Mr. MacElrevey, an original board member and also a key force in an artifact-filled Doo Wop Experience museum that opened in 2007. How much does Wildwoods love the Googie style? Enough that its Acme and Wawa markets and Walgreens all have neo-doo-wop-inspired signs. Today, the state-designated Wildwoods Doo Wop District is home to the largest concentration of preserved midcentury doo-wop buildings in the U.S. So when you stay in one of its motels, you’re living history. One of the most famous is the Caribbean, built in 1958, saved from demolition in 2004 and placed on the National Register of Historic Places in 2005. The first to “plant” plastic palm trees in the Wildwoods, it appears ready for blast off with a “levitating” ramp, canted glass walls and recessed “spaceship” lighting. Other notables include the Polynesian-themed Waikiki, the air-travel themed Pan American and the Chateau Blue Motel, built in 1962 with a heart-shaped pool. If you prefer neo-doo-wop, the boutique StarLux Hotel across the street from the huge Wildwood sign, originally built in 1957, is the bomb. A $3 million renovation in 2000 created lodging the Jetsons might consider checking into, what with its angular roof lines, all-glass lobby and lava lamps in each room. More adventurous guests can also bed down in one of two vintage Airstream trailers in a lot across the street. Getting there: The Wildwoods, N.J., is about 400 miles from Pittsburgh, but the 6½-hour trip is an easy highway drive via the Pennsylvania Turnpike to New Jersey’s Atlantic City Expressway/Garden State Parkway. Take Exit 4B and stay on Route 47 East until it becomes Rio Grande Avenue, which leads right into Wildwood. Where to stay: There are more than 8,000 hotel, motel and bed and breakfast rooms for all budgets on the island, including many in vintage doo-wop style motels. The retro StarLux (305 E. Rio Grande Ave., Wildwood; 1-609-522-7412) is the island’s boutique hotel, and has a new miniature golf course for the kids. One of the larger hotels on the island, the Adventurer Oceanfront Inn (5401 Ocean Ave.,Wildwood Crest; 1-609-729-1200) offers 2-, 3- and 4-room suites geared to families with pool and ocean views. Where to eat: The Wildwoods is not a foodie town, but that’s not to say you’ll go hungry. The boardwalk is home to all your favorite eats, from pizza and cotton candy to fudge, taffy and buckets of hand-cut Curly’s Fries, a beach staple since 1974. Some of it is incredibly cheap: A hot dog can be had for $1 and I lost count of the many $6.99 breakfast specials offered on the boardwalk. Off the boardwalk, we enjoyed authentic Neapolitan pizza at Poppi’s Brick Oven Pizza (4709 New Jersey Ave., Wildwood), decent Mexican at Bandana Mexican Grill (5607 Atlantic Ave., WIldwood Crest), and some of the largest mussels I’ve ever seen at Dog Tooth Bar & Grill (100 E. Taylor Ave., Wildwood). Other local favorites include Schellenger’s for seafood (3516 Atlantic Ave., Wildwood), Duffer’s for ice cream (5210 Pacific Ave., Wildwood) and Laura’s Fudge for saltwater taffy and candy (357 E. Wildwood Ave., Wildwood). Keep in mind that Wildwood Crest is dry. Activities: Bikes are easy to rent ($10 and up/hour) and are allowed on the boardwalk north of its famous 17-foot-high sign and colorful concrete beach balls at Rio Grand Avenue until 11 a.m. After that, pedestrians have to share the wooden walkway with the town’s famous Sightseer Tram Cars ($3 each way), which as day turns to night is no small feat given the crowds — when a voice warns “Watch the Tram Car, please!” it’s not kidding. Old-school Italians will be happy to teach you how to play bocce from 7 to 11 p.m. daily at Wildwood Bocce Court (6300 Ocean Ave.) and you also can take a free fitness class each day at 8:30 a.m. on the beach pier at Heather Road, Wildwood Crest. If you swim, there’s comfort in knowing the beaches have lifeguards and Wildwoods also has several designated surfing areas. The Wildwoods Boardwalk, which stretches 38 blocks, boasts three amusement piers featuring more than 100 rides and attractions. There’s also a waterpark. 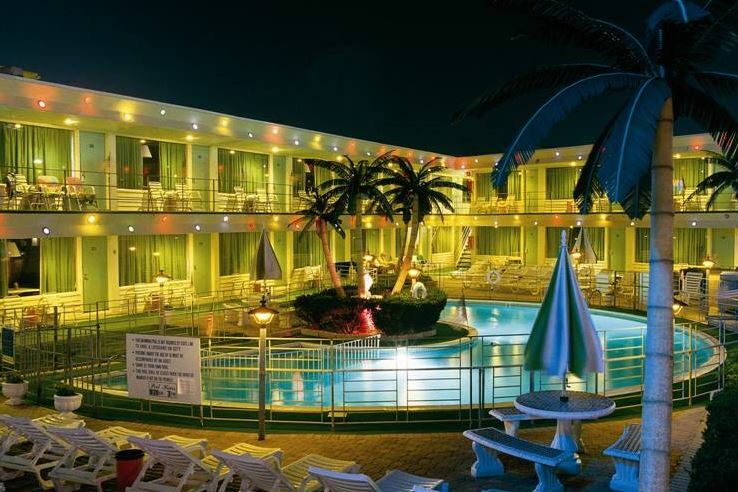 And for architecture fans, the Doo Wop Experience museum (4500 Ocean Ave., Wildwood, across from the convention center) offers guided “Back to the ’50s Neon Nights” bus tours every Tuesday and Thursday at 8 p.m. during the summer season ($13 adults/$8 kids; 609-523-1958). Or pick up a map for a self-guided tour at the free museum, open Tues., Thurs.-Fri. from 5 to 9 p.m., and 10 a.m.-10 p.m. Sat.-Sun. MASON NECK, Va. — George Washington’s Mount Vernon tends to get all the attention when it comes to historic homes in the Washington, D.C., area, and deservedly so: One of the most-visited Colonial sites in America, the white mansion with its 21 elegantly appointed rooms offers an authentic glimpse into the 18th-century plantation life of our first president. And how about that sweeping lawn and its magnificent views of the Potomac River? It’s not the only historic home worth a visit during Garden Club of Virginia’s Historic Garden Week, which this year runs April 23-30 and features more than 250 sites in all corners of the state. 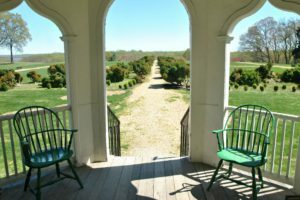 Twelve miles south on Route 1 on the marshy Mason Neck peninsula stands another gracious estate that in the late 1700s was home to one of Washington’s equally famous counterparts — George Mason’s Gunston Hall. It’s not nearly as fancy, or large, as that of his Fairfax County neighbor’s. And its once-formal garden, originally divided into quarters and edged in boxwood, is but an overgrown ghost of its former self. Yet like Mount Vernon, it offers an intimate look at how a very wealthy plantation owner and sometimes-forgotten founding father would have spent his days when our country was still a collection of colonies. Mason was a notoriously private man, and a bit of a curmudgeon. His home was his sanctuary. One of the richest planters in Virginia, Mason spared no expense in bringing his dream to life. A classic example of Georgian architecture, the two-story structure with its elegant Flemish bond brickwork — crafted from brick made on site — is a study in symmetry and balance. Its 10 dormers (five on each side) and four chimneys are symmetrical with the porticoed entrance on the center axis, with two nine-over-nine windows balanced on either side of it. The interior, meanwhile, is a fanciful mix of rococo, Gothic and chinoiserie styles that is something of a surprise, given that most homes during Colonial times favored simple decoration. The yellow ochre dining room, dubbed the “Chinese Room,” is particularly stunning with its pagoda-like hoods on the upper walls, wild Chinese wallpaper (a replica of a period design) and scalloped woodwork. 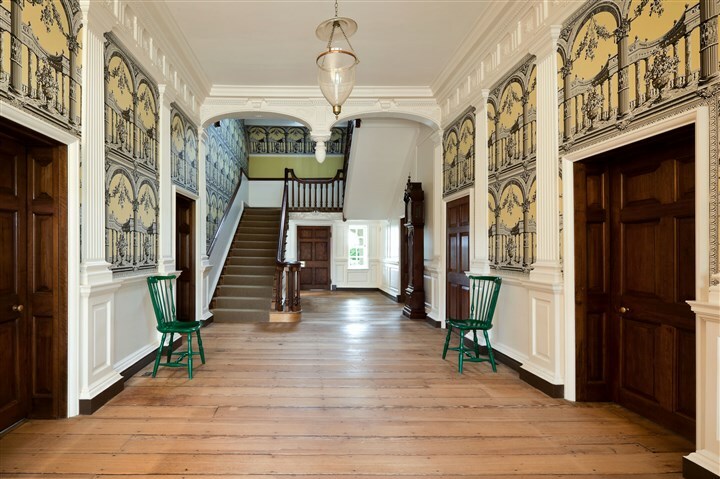 Not to mention a rare treat: Gunston Hall is the only house in Colonial America known to have had this Eastern-style decoration, which was all the rage across the pond in London. The Palladian Room, with its red silk damask-covered walls and elegant egg-and-dart molding, is equally splendid. The family would have played cards here, or maybe enjoyed a drink from Mason’s distillery with dinner guests, warmed by the large fireplace carved in the then-fashionable rococo design. The gilded beaufats (built-in niches) on either side of the fireplace would have displayed stoneware while the walls held portraits of Mason and his wife, Ann, who was just 16 when they married. Color was as much a sign of wealth in Colonial times as was intricate detail, and the largest room in the house, the 12-foot-wide Central Passage, delivers on both counts. Used to receive guests and also to teach children dance and manners two weeks out of the year, it’s a grand, welcoming space with a 12-foot, 8-inch ceiling. The intricately carved black walnut staircase speaks especially well of craftsman William Buckland, an Englishman who came to Virginia in 1755 as an indentured worker. Tourgoers also get to see Mason’s first-floor bed chamber with its emerald-green woodwork and canopied bed, and the neat and plain study with a pair of windowseats where Mason conducted his business; a pole ladder given to him by Thomas Jefferson leans against the wall. Upstairs, there’s seven dormitory-style bedrooms, although guests looking up the staircase would have imagined something far grander, thanks to a triple arch with fluted columns separating the narrow passageway from a small gallery overlooking the staircase. Originally, double rows of black heart cherry trees lined the 1,200-foot drive to the front porch with its Palladian portico. They were planted not on lines perpendicular to the mansion, as expected, but on radial lines projected from the entry — a trick that created a false perspective, making the trees “seem to approach as they recede.” Most guests, however, would have arrived by boat at the rear of the house, as traveling over land was extremely difficult. At one time, there were at least 30 outbuildings on the 5,000-acre estate, which Mason inherited at age 10, after his father drowned in a sailing accident on the Potomac. Gunston Hall was a working plantation that produced corn, wheat and tobacco for export, and the family had paid employees along with indentured servants from Europe and as many as 120 domestic and field slaves, who were housed in a “logtown” just out of sight of the main house. Today, there’s a mere handful, including a re-created schoolhouse, a laundry and an outdoor kitchen in which interpreters sometimes cook over an open fire in a massive, walk-in fireplace. The quartered one-acre garden and 12-foot-wide gravel paths (the same width as the home’s central passage) that visitors arriving by boat would have strolled on their way to the rear portico are long gone, but some of the boxwoods date to Mason’s time. They’re massive, with gnarly, twisted trunks. Mason preferred the solitude of his plantation over the hustle and bustle of his public duties in Richmond and Williamsburg, and gladly retired there after the Philadelphia Convention. He died there at age 67 in 1792. (He’s buried, along with his first wife, Ann, in the family burying ground beyond the school house.) The house would stay in the family until 1867, then have four more owners, the last of which would gift the property to the commonwealth as a museum to be run by the National Society of the Colonial Dames of America. It was among the first U.S. properties to be named a national historic landmark (in 1960), a designation that stresses its importance not to just a local community or state but to the history of the entire nation. 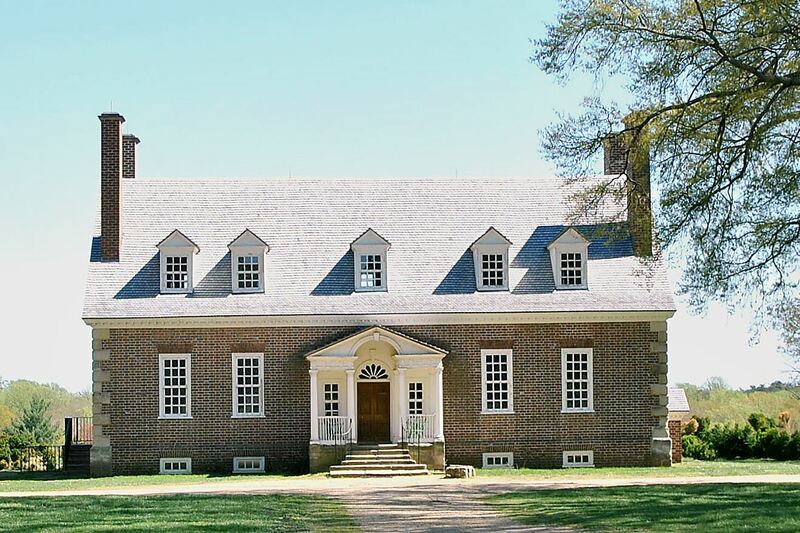 Because Gunston Hall was located on the road from Richmond to Philadelphia, leaders traveling from one capital to the other sometimes stopped by. So when you walk on its original yellow pine floors, you’re walking in the footsteps of George Washington, Thomas Jefferson, James Madison and James Monroe, along with more recent visitors Winston Churchill and Kate Hepburn. Getting there: Gunston Hall Plantation (10709 Gunston Road, Mason Neck, Va.) is 20 miles south of Washington, D.C., on the Potomac River. From Interstate 95 south, take exit 163 toward Lorton (VA-642). Turn left onto Lorton Road, then right onto Lorton Market Street, which becomes Gunston Cove Road after crossing Richmond Highway/Route 1. The Gunston Hall entrance is 3.5 miles on the left. From Pittsburgh, it’s about a 4½-hour drive, depending on traffic (which on the beltway in D.C., can be horrific). Guided tours are offered daily on the half-hour between 9:30 a.m. and 4:30 p.m., except for Thanksgiving, Christmas and New Year’s Day. Entrance is $10/adults, $8/seniors and $5/children ages 6-18. If you don’t care so much about the house, a $5 grounds pass allows you to tour the outbuildings, visit George Mason’s burying ground, picnic, view the Potomac and hike the site’s trails. Free entrance for all active duty, National Guard and Reserve military personnel and their families from Memorial Day through Labor Day. Eat/drink: Guests can order a picnic lunch 24 hours in advance (48 hours on a Sunday) and have it delivered and waiting for them. Blu 1681 in nearby Woodbridge offers waterfront dining, and in the historic town of Occoquan you’ll find the Bottle Stop Wine Bar and charming Secret Garden Café. If you feel like splurging, or are hungry for the flavors of early America, the Mount Vernon Inn Restaurant is just a short 13 miles north on Route 1. For the budget-minded, there are many fast-food and casual chain restaurants in nearby Lorton, including IHOP and Glory Days Grill, a burger joint. 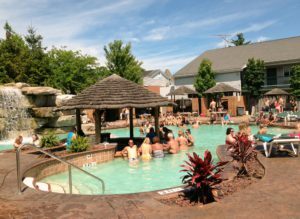 Lodging: There are any number of chain motels and hotels nearby in Fort Belvoir, Woodbridge, or Mount Vernon, Va., as well as in the D.C. metropolitan area. WASHINGTON, D.C. — Summer is quickly coming to a close but if you’re headed to the nation’s capital before Labor Day, there’s still time to squeeze in a quick trip to the beach. Just don’t worry about packing sunscreen, a beach bag or even a bathing suit. “The BEACH” exhibit at the National Building Museum’s Grand Hall features neither sand nor sea, and the only chance you’ll get a sunburn is during your walk from the National Mall to the 30-year-old cultural institution on F Street NW. But like a day at the shore, you’re sure to have fun, especially if you’re traveling with children. Conceived in partnership with Brooklyn-based design firm Snarkitecture, the interactive architectural installation aims to re-create the “familiar experience” of a summer day at the beach. Only instead of dipping their toes into the Atlantic, visitors get to hang their feet and/or immerse their bodies into an “ocean” of plastic balls. There’s almost 1 million of the tennis ball-sized translucent orbs, filling a sloped shoreline that stretches 50 feet from a bank of wooden beach chairs to a mirrored wall that reflects its stark, white seascape. In all, the temporary exhibit encompasses 10,000 square feet of the museum’s first floor, along with two of its four colossal marble Corinthian columns. As a result, it’s noisy. There are tons of little children. And all the good spots for lounging are taken. (In other words, it’s very much like the real beach.) Also, although rules prohibit any throwing of balls, you might get hit in the head with one anyway. Kids, after all, will be kids. I, rather stupidly, jumped into the bright-white “ocean” with my shoes on and purse open. Big mistake. I immediately sank a good 3 feet (think quicksand instead of water), and it took my husband a good 2 minutes to pull me up to the side — to the amusement of many — as I struggled to keep my sandals connected to my toes. Touching the bottom felt impossible. But what fun! There’s no time limit once inside, and if you get hungry or thirsty while playing, Union Kitchen, a D.C.-based food incubator has a snack concession serving ice cream, candies and other snacks, including a cheese board with dried fruit and crackers. And if the thought of “swimming” in a giant pool of balls that have been touched by thousands of bare feet gives you the willies? Not to worry. The balls are made with an antimicrobial called Germ-Block, eliminating any chance of catching cooties. The museum also does “spot cleaning” when necessary. 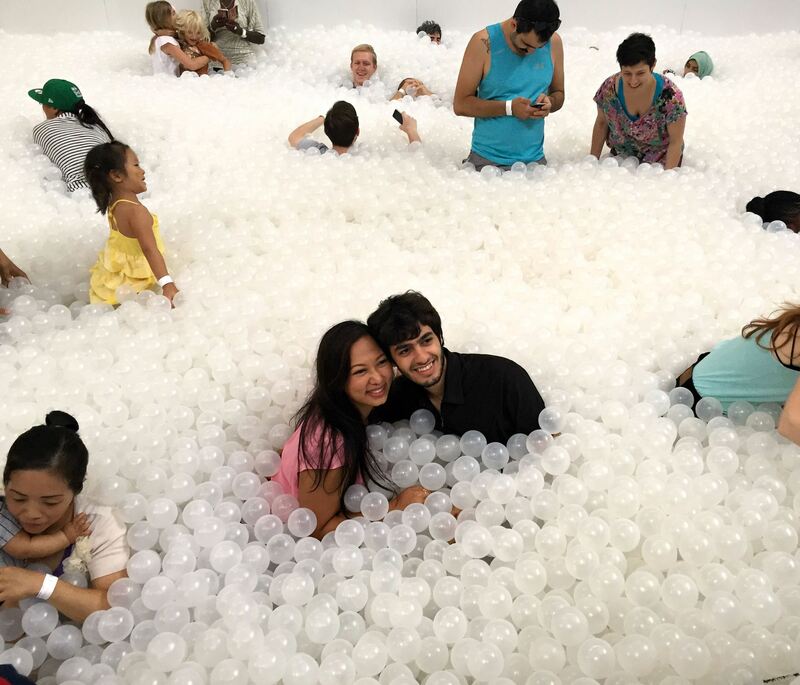 “The BEACH” is part of the museum’s annual “Summer Block Party” that includes special programming, exhibitions and events for all ages. It follows the success of last summer’s “BIG Maze,” a 60-by-60-foot wooden maze inspired by ancient labyrinths, garden and edge mazes of 17th- and 18th-century Europe. Among other exhibits included in the entry price are a photo exhibit of renovations to the Washington Monument and Washington National Cathedral, captured from the scaffolds, and a collection of 60 three-dimensional models — suspended from the balconies of the Great Hall — that showcase how local culture and climate shapes architectural design. There’s also a play-work-build room where visitors big and small can play with blocks. BROWNS MILLS, N.J. — Love ’em or hate ’em, cranberries have long been part of America’s culinary history. Even before Gen. Ulysses S. Grant gave orders in 1864 for the tart ruby berries to be given to Union soldiers as part of their holiday meal, cranberries were common on the table. Native Americans ate them and the wild perennials also were part of New Englanders’ diet in the mid-1700s, cooked with maple syrup or honey into sauces, preserves and tarts. 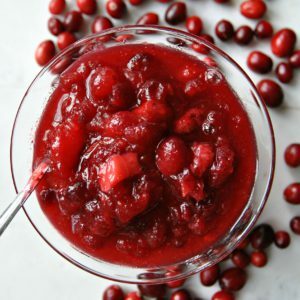 Yet it wasn’t until the 1930s, when the Massachusetts Ocean Spray cooperative started selling whole and jellied cranberry sauce, that the berry was really woven into America’s Thanksgiving fabric. It’s a rare holiday celebration that doesn’t include a log of canned sauce or some spiffed up homemade variety; its tart-sweet zing adds a welcome punch of flavor, color and texture to tender slices of turkey. 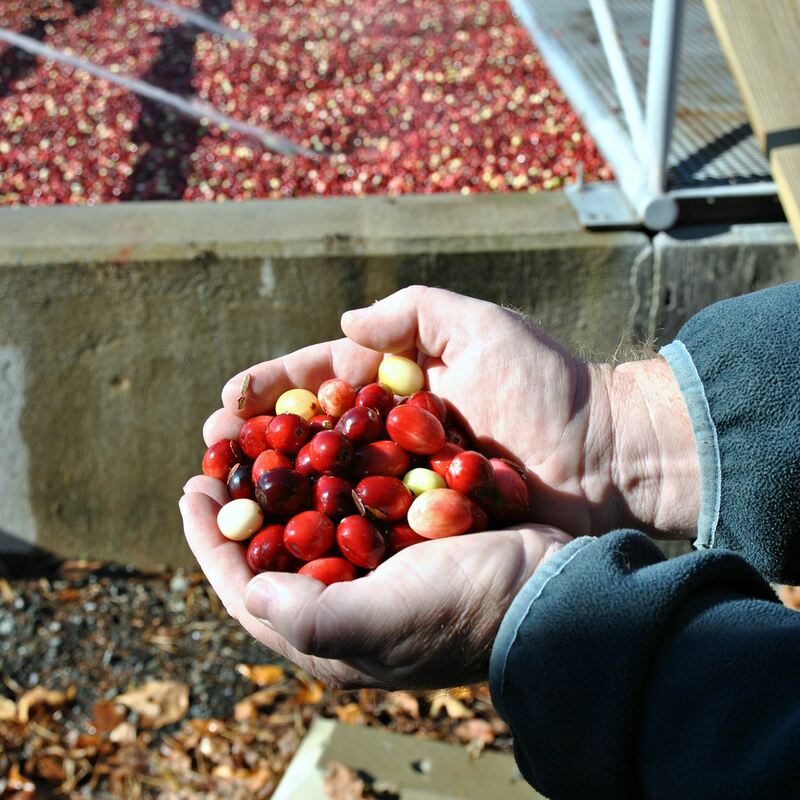 One of just a handful of native American fruits to be commercially grown, cranberries are most associated with New England, thanks to those kooky “straight from the bog” TV commercials starring faux fruit growers Justin and Henry. Yet Wisconsin actually is the country’s leading grower of the little red berries (it produced some 5.3 million barrels of fruit in 2014, or 530 million pounds). 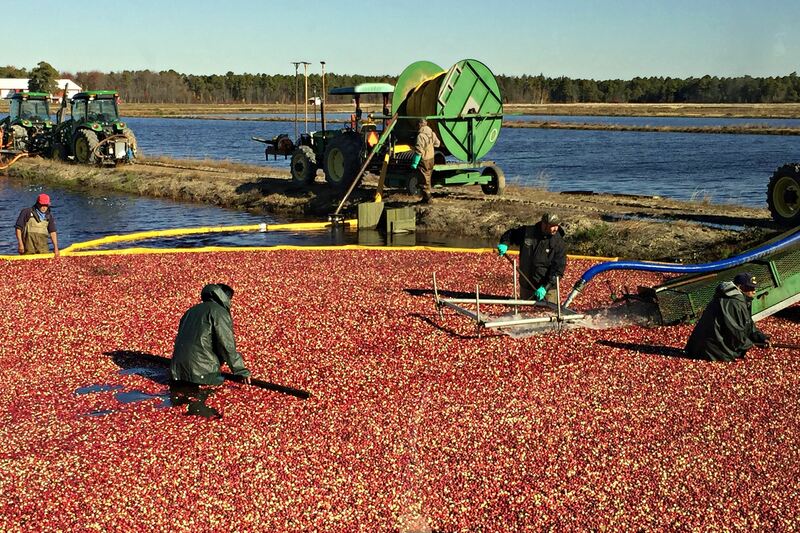 New Jersey also has a thriving cranberry industry, with more than 3,000 acres of cranberry bogs producing 626,000 barrels. 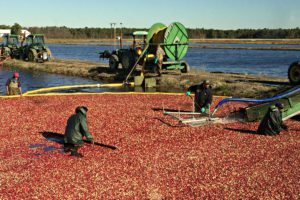 Cranberries thrive in sandy, acidic soil and Jersey’s Pine Barrens region — where the ground fruit has been cultivated since the mid-1800s — is rich in both. Many of the state’s 20-plus farms are descendants of the original growers. Joseph J. White, a fifth-generation cranberry farm at Whitesbog, Pemberton Township, has been growing cranberries for more than 150 years. Second-largest in New Jersey, it has 76 bogs of different sizes and varieties covering 350 acres in production. During the fall harvest, growers Brenda Conner and Joe Darlington, who market the fruit under the Pine Barrens Native Fruits label, give bus tours ($35; pbnf.co) to the sandy roads and narrow dams surrounding the bogs. It’s fascinating. Workers start “corralling” the fruit in early October — 500 pounds every 2½ minutes — and are generally finished well before Thanksgiving. Just a tiny portion of the seasonal haul makes it to the market fresh; most berries are shipped north to Ocean Spray (whose cooperative now includes 700 grower families) to be canned, bottled or dried. Because they’re fragile, fresh berries have to be dry harvested — that is, picked while the vines are completely dry with a lawnmower-like mechanical harvester. What you get to see at the White’s farm from the bus is the more interesting wet harvest, which involves flooding the bogs with water so the cranberries float to the surface. Soon, though, they realized the entire process could be made much easier by flooding the field at harvest time, beating the submerged vines, and letting the berries float to the surface, where they could be skimmed away. The man-made cranberry bog was born, and cranberries were gathered by workers with wooden brooms and then sucked onto trucks by a conveyor belt. Seeing all the fruit crushed by the rolling harvesters, Ms. Conner told her husband, Joe, that she could increase yield by 20 percent if he would just build her a floating harvester: a one-man barge equipped with spinning beater arms that could be towed back and forth across the water, whacking away at what lies beneath without causing so much damage. He did, and today the farm’s bogs average 280 to 300 100-pound barrels per acre each season. Whether they make it north to Ocean Spray depends on how well they bounce — the sprightlier the specimen, the tastier the berry. Substandard ones go into the compost pile. Piloting the floating harvester, which is guided by GPS, Ms. Conner says, “is like playing Nintendo.” But it’s far from a game. To be a cranberry farmer is to always be on call with Mother Nature. The vines must be properly irrigated to protect them from frost 24/7; when the temperature dips below about 23 degrees, growers have to “run frost,” or run their irrigation pumps to warm up the bogs, or freeze the water they put out to create a protective ice layer around the plant tissue. The tour concludes with a cooking demonstration and cranberry tasting. Guests get a packet of family recipes. A versatile fruit, cranberries are good for everything from appetizers, bread and salads to sauces and desserts. Even if you think you don’t like cranberries you probably should: Because of their disease-fighting antioxidants, they’re considered a super fruit along the lines of blueberries (which the White farm also grows); sailors in the 19th century ate them to ward off scurvy. They’re also high in vitamin C, fiber-rich and a low-cal treat at only 45 calories per cup — although any caloric benefit is easily negated by all the sugar many recipes require to make them more palatable. You also can eat them out of hand, like Ms. Conner, if you have a toothpick and a bowl of caramel. Fresh cranberries will last for two months in the refrigerator in a tightly sealed plastic bag, and they freeze well for up to a year. So now’s the time to stock up so that you can experiment throughout the winter. Where: J.J. White, which sells under the label Pine Barrens Native Fruits, is located at 1 Pasadena Road, Browns Mills, N.J. It’s about an hour from downtown Philadelphia on New Jersey Route 70E. (Look for mile marker 32.5 on Route 70, then turn right onto a dirt road. Parking lot is a short distance on the left.). When: Bus tours of the cranberry bogs are expected to start the first weekend in October 2016 and run for about five weeks. Tickets: Individual tickets cost $35 and are available Fridays and Saturdays. (Weekdays are reserved for group tours.) Tours begin at 9 a.m., rain or shine, and are three hours long. More info: 1-888-272-6264 or tours@pbnf.com. This easy whole-berry sauce is sweetened with orange juice. Save the leftovers to mix with olive oil, balsamic vinegar and Dijon mustard for a salad dressing. Rinse cranberries under cool water, then sort and discard any damaged or bruised cranberries. Place sugar, orange zest and juice and ½ cup water in medium saucepan; season with a pinch of salt. Bring to a boil over medium-high and stir to dissolve sugar. Add berries. Reduce to a simmer and cook until thickened, 20 to 25 minutes; berries will pop. Remove from heat and let sauce cool completely at room temperature; it will thicken as it cools. Transfer to a bowl to chill in the refrigerator. 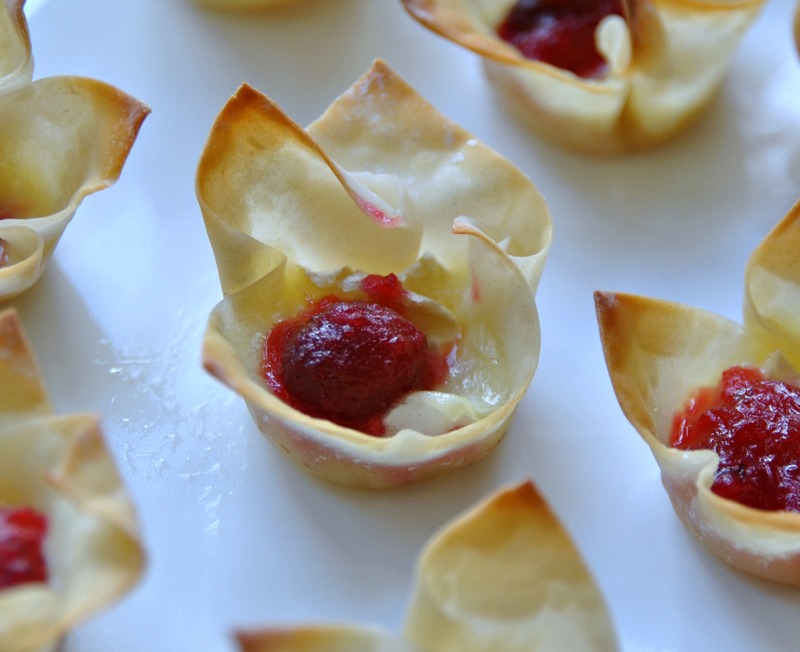 An easy make-ahead appetizer or snack that is pretty enough for entertaining. Place cranberry sauce in a small saucepan. Cook over medium heat until hot, stirring occasionally. Remove from heat; stir in lemon juice and lemon peel. Meanwhile, heat oven to 350 degrees. Spray 24-cup mini-muffin pan with nonstick cooking spray. Center a wonton wrapper over each muffin form, push down with fingers to make a little bowl, with the corners sticking up, and bake for 10 minutes. Place 1 cube of brie in each wonton bowl. Bake for 5 minutes, or just until cheese melts and wonton tips are beginning to turn brown. Remove from oven; top each cup with 1 teaspoon of cranberry mixture. Serve warm or at room temperature. These are great for garnishing cakes, pies and other holiday treats or simply popping in your mouth when you need a sugary, lip-puckering snack. Combine granulated sugar and water in a small saucepan over low heat, stirring mixture until sugar dissolves. Bring to a simmer; remove from heat. Stir in cranberries; pour mixture into a bowl. Cover and refrigerate at least 45 minutes or up to overnight. Drain cranberries in a colander then place on rack and allow to dry at least 45 minutes (this allows them to get sticky). Place sugar in a shallow dish. Add the cranberries, rolling to coat with sugar. 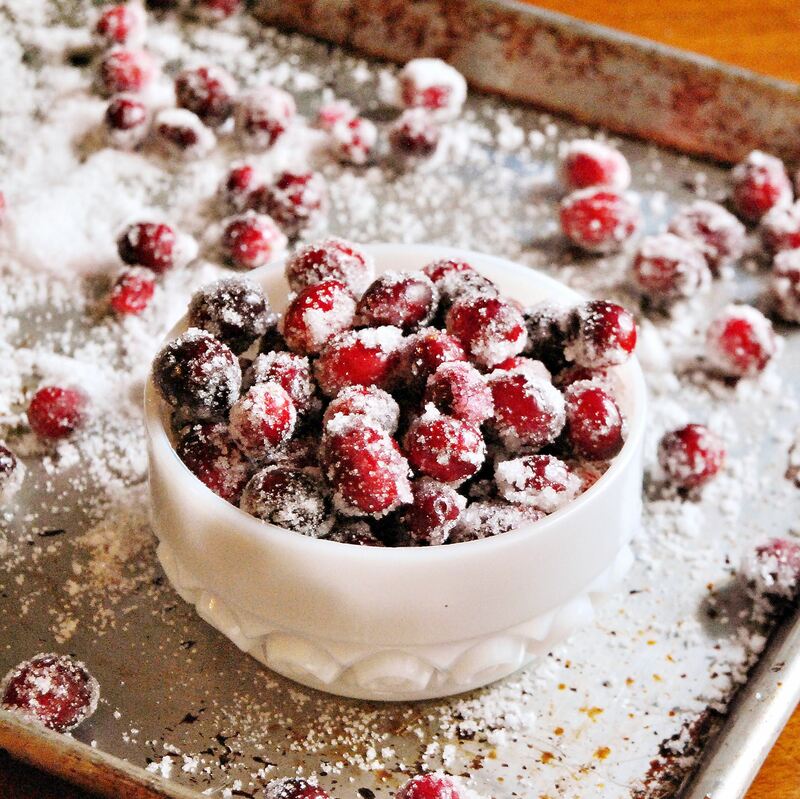 Spread sugared cranberries in a single layer on a baking sheet; let stand at room temperature until dry. This New England spin on the traditional upside-down cake is about as easy as it gets when it comes to dessert or, in my case, breakfast. Heat oven to 325 degrees. Butter bottom and halfway up sides of an 8-inch square glass baking dish using 2 tablespoons butter. Spread cranberries evenly over bottom of dish. Sprinkle pecans on top, then sprinkle with ⅓ cup sugar; set aside. Melt remaining 6 tablespoons butter in a saucepan over medium-low heat; set aside. Put egg and the remaining ½ cup sugar in the bowl of an electric mixer fitted with the whisk attachment. Beat on medium-high speed until pale and thick, about 1 minute. Reduce speed to medium-low; gradually beat in flour and then salt. Pour in melted butter in a slow, steady stream, beating until smooth. 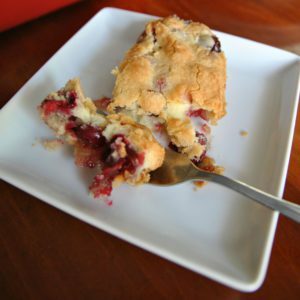 Slowly pour batter into pan to cover cranberries. Bake until golden brown and a cake tester inserted in center comes out clean, about 45 minutes. Let cool on a wire rack 10 minutes. Run a knife around edge to loosen, and invert to unmold onto a serving platter. Serve warm or at room temperature. LURAY, Va. — Some years ago, fresh out of college and poor as church mice, my husband and I set out on our great honeymoon adventure. Our three-day drive from Pittsburgh to jobs in Miami would take us through Virginia’s picturesque Shenandoah Valley. To humor my father, we agreed to stop at Luray Caverns. Discovered in 1878 and named a National Natural Landmark in the early 1970s, the 64-acre series of subterranean rooms and passageways proved pretty amazing, despite a hokey tour that takes visitors more than a mile and 160 feet below the surface. There’s something magical about being deep underground, where the temperature is always 54 degrees, and still feeling dwarfed by nature; some of the cavern’s dimly lit rooms soar 10 stories. And how cool is the cavern’s sparkling Dream Lake, which reflects myriad stalactites hanging above on the ceiling? We knew someday, we’d be back. Our redux came earlier this month, after dropping our daughter off for her sophomore year at James Madison University. It proved just as fun as the first time. We started our trip in scenic Harrisonburg, home to the university. Known as part of the “Breadbasket of the Confederacy,” it’s a must-do for history buffs interested in Civil War battlefields and historic sites such as the Hardesty-Higgins House, used briefly as headquarters for Union Gen. Nathaniel Banks. It’s equally popular with bicyclists, thanks to multiple road and mountain-biking trails, and also a boon for foodies, who have dozens of restaurants to choose from in the state’s first designated culinary district. Add three craft breweries, a cider house and a pair of wineries to the victual delights. After moving Liv into her dorm, we saluted the fall semester with a terrific lunch of pulled pork and cheese grits at Clementine Cafe on South Main Street, also an art gallery and live music venue. Then it was on to Kline’s Dairy Bar — a local institution since 1943 — for orange creams. Bidding Olivia a teary goodbye, we drove a half-hour south to Staunton. It’s tough to imagine a small town more charming than Staunton (don’t make the mistake we did — it’s pronounced “Stan-ton” y’all! ), home to Mary Baldwin College and the Woodrow Wilson Presidential Library and Museum. Extremely walkable, it’s postcard pretty. And talk about things to do: Its six-block main street bustles with antique shops, art galleries, restaurants, coffee shops and quaint boutiques ripe for the picking. While the playhouse is lively, the town after hours is anything but: Save for Zynadoa (serving upscale Southern food) and Byers Street Bistro, where we ate burgers at the bar and listened to a band from Richmond, Staunton pretty much rolls up the sidewalks after dark. Then again, you want to be up early Saturday morning for the farmers market at the corner of Byers and Johnson streets in the Wharf District, lush with locally grown produce, organic honey and baked goods. We’d hoped to take a peek inside Trinity Episcopal Church, which contains 12 Tiffany windows spanning Louis Comfort Tiffany’s 40-year career, but the doors were locked. So instead, my husband talked me into visiting Bruce Elder’s antique/classic car museum, located in a 1911 Ford dealership building. 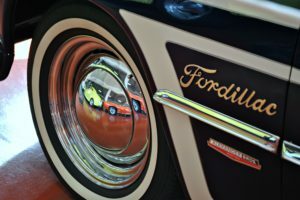 For $5, we got to see two floors of more than 50 cars, both for sale and display, including Richard Petty’s 1987 Pontiac Grand Prix Winston Cup Race car, a 1911 Chalmers Model 30 with wooden spoke wheels and the ’35 Packard convertible Arthur Miller drove Marilyn Monroe in. As payback, I insisted we do a craft beer tasting ($10 for four) at Redbeard Brewing, a small batch brewery on Lewis Street. I recommend the Black Rye IPA, along with the burgers, on your way out of town at the nondescript Marino’s Lunch on North Augusta Street. A fave with locals, it’s been a beer joint and legendary bluegrass hot spot for more than 100 years. Staunton is just a few miles from the Rockfish Gap entrance to Shenandoah National Park’s Skyline Drive, where the $20 per car entry buys you seven days on the 105-mile drive. If you plan on hiking, ask the park ranger at the gate for trail maps; they’re marked with elevation, distance and effort (easy to challenging). We did two hikes during our stay: the 2.2-mile loop to the Turk Mountain Overlook (harder than it looked) and the 1.6-mile Stony Man Trail partway along the Appalachian Trail to Stony Man Summit, Shenandoah’s second highest peak at 4,010 feet (easier than we imagined). If you just plan on going point to point by car, know that the 35 mph speed limit makes for slow driving. Sometimes infuriatingly so, as drivers pull on and off for the drive’s 75(!) overlooks. We thought the views of the rolling piedmont to the east were more spectacular than those of the Luray Valley to the west, but they’re all Instagram-worthy (even if you can’t immediately post them due to poor cell service). Another long queue is in store if you don’t get to Luray Caverns early; by 11 a.m., the line already was snaking out the door, even for those smart advance-ticket buyers. The hourlong tour, though, is lots of fun if you don’t mind the dawdlers at the rear or getting poked by picture takers on the narrow passageway. Be sure to rub the “eggs” on the way out — the only parts of the cavern that you are allowed to touch — for good luck. Admission to the caverns includes The Car and Carriage Caravan Museum, but we opted instead for the adjoining Luray Valley Museum (also free) to learn about local history and see artifacts from the 1750s to the 1920s; the museum also includes a seven-acre re-creation of a small 19th-century farming community. Still got some energy? Kids will love the Garden Maze ($9 adult, $7 ages 6-12), and who can say no to a tasting of local wines in the 1860 Burner Barn (weekends only through fall)? After a quick exploration of Luray’s historic main street, we made one last stop before heading back north: the Virginia Farm Market in Winchester (look for the big red barn). 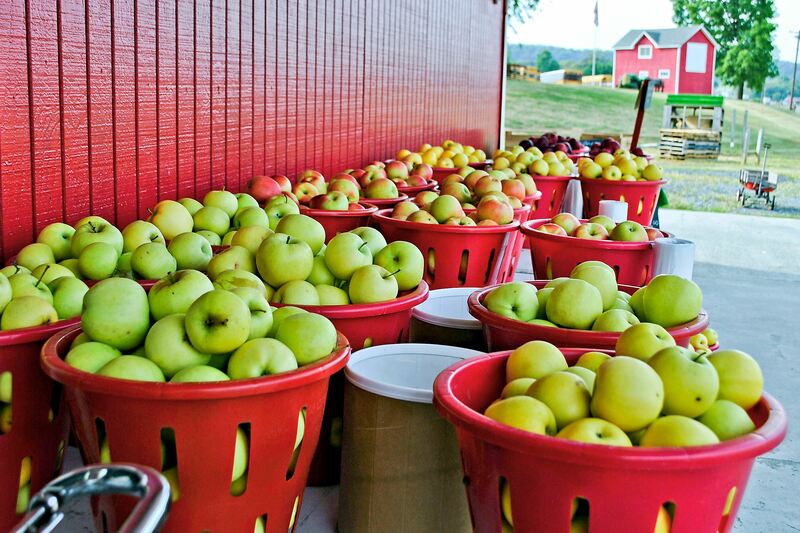 In addition to jug-your-own cider and a dozen or more varieties of locally grown apples to choose from (Winchester is known as the Apple Capital of Virginia), its pumpkin patch during the season boasts 15,000 pumpkins. Splurge on the apple cider doughnuts. You’ll eat at least two on your way to the parking lot. • Getting there: Bordered by the Blue Ridge Mountains to the east and the Alleghenies to the west, Virginia’s Shenandoah Valley stretches some 200 miles from Harpers Ferry, W.Va., to Roanoke, Va. Skyline Drive is the only public road within Shenandoah National Park. The park is open year-round pending weather, although most visitor facilities and services close down completely from late November to March. To check status, call the park’s recorded information line at 1-540-999-3500 or visit nps.gov/shen. The are four entrances to Skyline Drive: At Front Royal near Route 66 and 340; Thornton Gap at Route 211; Swift Run Gap at Route 33; and Rockfish Gap at Route 64 and Route 250 near Staunton (where we started). Cost is $20 per vehicle for seven consecutive days; it takes about three hours to travel the drive’s 105 miles on a clear day (the speed limit is 35 mph). From Pittsburgh, the 300-mile drive takes about five hours via Harrisonburg and Staunton, Va.
• Lodging: Living large, or on a budget? The area features a variety of chain hotels/motels and small inns in all price ranges. For B&B types, the historic Joshua Wilton House Inn ($145 and up) and Stonewall Jackson Inn ($139 and up) in Harrisonburg are good bets; the Queen Anne-style Berkeley House Inn B&B in Staunton ($149 and up) dates to 1893. We overnighted at the very lovely Stonewall Jackson Hotel in historic downtown Staunton. Built in 1924 and lovingly restored in 2005, it’s recognized by the National Trust Historic Hotels of America for its historic and architectural significance. 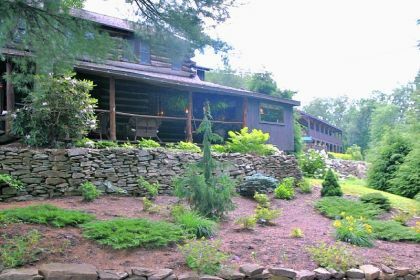 You’ll also find comfy rooms within the park at historic Big Meadows Lodge, Skyland Resort (the highest point on the drive) or Lewis Mountain Cabins. $109 and up; reserve at goshenandoah.com/lodging or 1-877-847-1919. If you’d rather rough it and don’t fear wildlife (this is black bear country), the park is happy to oblige with four campsites along Skyline Drive. Prices start at $15 for a tent site with common restrooms; reservations may be made up to six months in advance online at recreation.gov/shen, or by calling 1-877-444-6777. 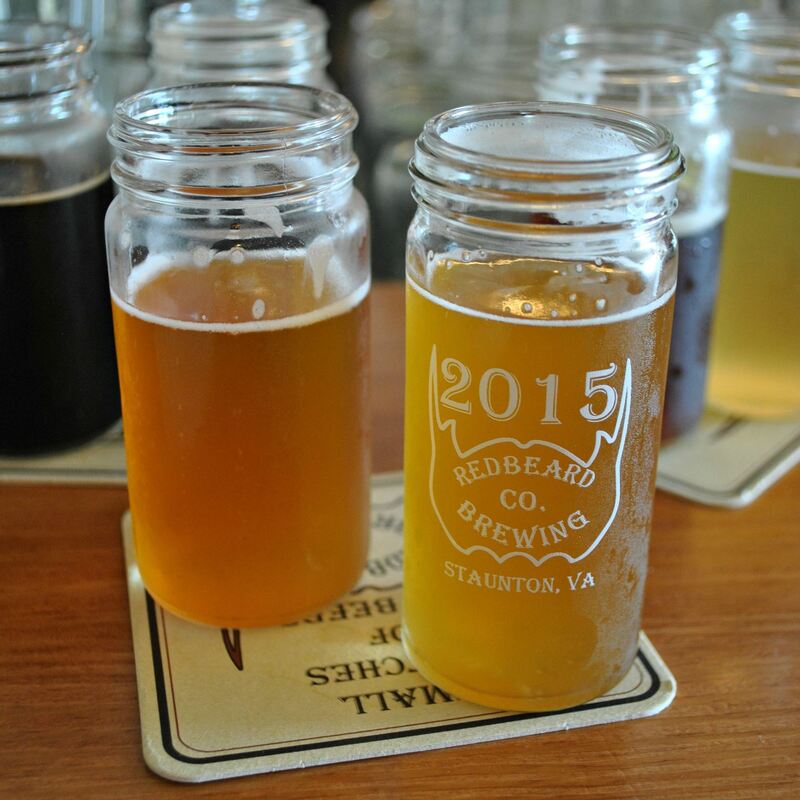 • Eat, drink and be merry:You won’t want for a good meal, or beer, in the Shenandoah Valley. In 2014, Harrisonburg became the first city in Virginia to adopt the designation of “Downtown Culinary District.” Some of the best choices include Clementine Cafe (which doubles as an art gallery), Bella Luna Wood-fired Pizza, Jack Brown’s Beer & Burger Joint and A Bowl of Good Cafe (closed Sundays). For local craft beers, the tap room at Three Brothers Brewing features 10 rotating drafts (open Thursday-Monday). You’ll find equally good eats in Staunton, including the tiny 26-seat The Shack, voted one of Southern Living magazine’s Best New Restaurants in 2014. Chef Ian Boden serves a prix-fix menu on weekends and burgers made from local meat on weekdays. If they’re on the menu, the pork cracklins with sorghum hot sauce are nothing short of amazing. Zynodoa (Southern cuisine) and Mill Street Grill (ribs, seafood and pasta in a century-old flour mill) also are highly recommended, and we had a terrific breakfast at Cranberry’s Grocery & Eatery. And we loved the beer tasting at the funky, small-batch Redbeard Brewing ($10 for 5 tastes; Thursday-Sunday). • Activities: Staunton is an antiquer’s paradise, and it also boasts art galleries, boutiques, an antique car museum and a lively farmers market on Saturday. If you like theater, Blackfriars Playhouse at The American Shakespeare Center hosts an internationally acclaimed theater company that performs Shakespeare’s works under their original staging conditions. The area also is renowned for its outdoor activities. Shenandoah National Park has more than 500 miles of trails, including 101 miles of the Appalachian Trail. There’s also biking, fishing, horseback riding and 105-mile Skyline Drive. • More info:visitshenandoah.org or visitskylinedrive.org. BENTON, Pa. — Fresh air and blue skies are easy tonics for the stressed-out city life. Still, I was in a pretty foul mood when I rolled into Ricketts Glen State Park in this scenic, woodsy corner of northeastern Pennsylvania. 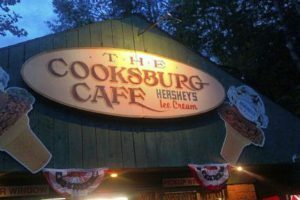 Equally distracted by my growling stomach and the country tunes wailing on my car radio, I’d missed the rustic carved-wood entrance sign opposite Red Rock Scoops ice cream shop on Route 118. Google Maps had vaporized along with my cell phone service and, seriously, who still keeps paper maps in the glove box? Even after a kindly park ranger provided step-by-step directions to the Lake Rose Trailhead Parking lot, the best place from which to start a hike to the park’s famed Ganoga Falls, I’d managed to get turned around in the wrong direction. (I later learned there’s a really cool interactive map on the DCNR website that could have come to my rescue.) A couple of times. But finally, I found it. The road leading to Waterfall Heaven. Three and a half miles north on PA Route 118 after it intersects with Route 487 (look for the Red Rock Corner Store), up a VERY steep mountain, Main Park Road snakes off to the right. Five minutes later, I was backing into a space at the crowded Lake Rose lot. Or so I thought: I’d actually pulled into Beach Lot #2, where boaters, swimmers and anglers go when planning a day on the park’s 245-acre Lake Jean. This actually turned out OK for two reasons: The concession stand had $3.25 cheeseburgers, and a friendly couple from upstate New York I met in the parking lot had great words of advice, along with directions to where I wanted to go. Don’t forget a water bottle, they cautioned, as there’s no refreshment on the trail. And go for the 3.2-mile upper loop of the Falls Trail instead of the 7.2-mile full loop, which took the pair almost 3 hours to complete. You’ll still see most of the good stuff, including the majestic 94-foot Ganoga Falls, in a picturesque glen among towering pines, hemlocks and oaks, but with half the effort — a physical exertion, they assured me with damp brows and quivering legs, that’s quite substantial when you hike the entire, rocky distance. After hiking it, I would recommend ditching the flip-flops and sneakers for sturdier shoes or hiking boots and resist the urge to take short cuts or venture out on ledges. Some of the terrain is pretty treacherous. Adventurous hikers have been sweating their way throughold-growth timber to Ganoga Falls for decades, even before the park and its many recreational facilities open for business in 1944. Discovered in the 1860s by fishermen exploringKitchen Creek in neighboring Luzerne County, they date to the last ice age, when increased flow in the Huntington Laketributary from glaciers enlarged its drainage basin and cut deep gorges. 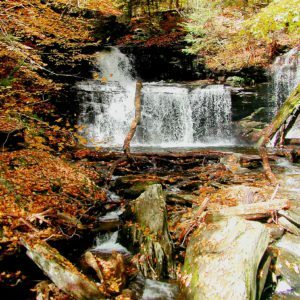 It wasn’t until Col. Robert Bruce Ricketts named and built a system of trails connecting the series of 22 waterfalls in the early 1890s, however, that they became one of Pennsylvania’s treasures — and the ideal setting in which to enjoy the fall colors. The park also has a nice sense of history. A Civil War veteran who distinguished himself at the Battle of Gettysburg, Col. Ricketts grew up in nearby Orangeville, a tiny hamlet nearby that today is famous for its twin covered bridges. 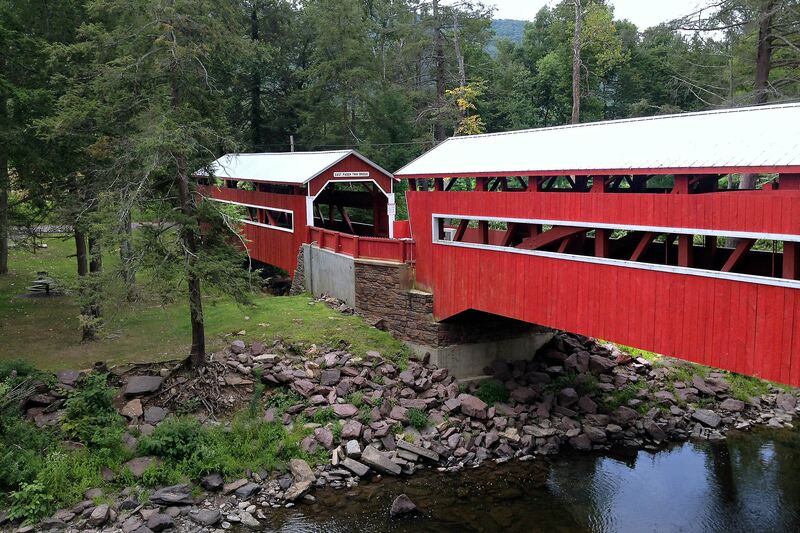 Built in 1884, the picturesque East and West Paden bridges are one of the only two remaining twin covered bridges in the country. After the war (where he led the defense against a Confederate attack on Cemetery Hill on July 2,1863), Col. Ricketts starting buying timber land in Columbia, Luzerne and Sullivan counties, eventually acquiring more than 88,000 acres. Much of it surrounded Ganoga Lake, Lake Jean and what would eventually become known as the Ganoga Glen area. A member of the Wyoming Historical and Geological Society, Col. Ricketts named many of the falls after the Indian tribes that at one time lived in the area: Delaware, Seneca, Tuscarora, Huron. Others wear the names of family members or friends. Ganoga Falls, which cascades 94 feet onto the rocks below, is the highest and most spectacular. It means “water on the mountain” in the Seneca language. After his death, Col. Ricketts’ heirs sold much of the land to the Pennsylvania Game Commission. But not all: It wasn’t until 1942 that they finally sold 1,261 acres, the Falls and the Glens area to the state for use as a state park. The Glens became a registered National Natural Landmark in 1969, and in 1993 was slated a State Park Natural Area. Most of the glen’s 22 waterfalls, scattered along 26 miles of trail marked by zig-zaggy switchbacks and dramatic drop-offs, are visible from the Falls Trail. 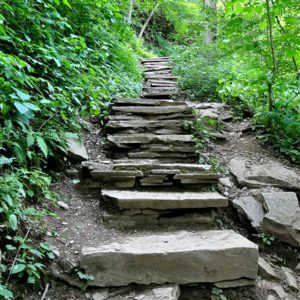 In all, there are 11 individual well-marked trails that range from less than a mile to more than seven, with varying difficulty for hikers. The trails can be deceptive. A quarter of a mile into the Falls Trail, with the very soft, fairly level terrain cushioning my Mizunos, I was marveling at how great the path would be for a trail run. Then I started down the hill toward the first of the seven falls I’d eventually encounter on my hike, Mohawk Falls, and all bets were off. I was praying I wouldn’t slip on the velvety greenmoss or twist an ankle on the narrow stone steps that at times seem awfully close to the edge of trail. But the hike is worth it. Photos taken with iPhones don’t do justice to the sheer awesomeness of Ganoga Falls and its thunderous cascade of water. I don’t think I’ve ever seen a prettier sight in a state park, Niagara Falls excluded. I’m kidding, of course. Hiking the trail is a great time and you don’t have to be in particularly great shape to do it. Along with kids (some on their parents’ backs), seniors were well represented. From the Lake Rose Trailhead lot, it took me about 30 minutes to hike down and maybe 10 minutes longer to climb back up. And no trips to the ER. Even if you miss the fall colors, this park is a gem. Besides hiking, the park offers swimming (May to September) camping, boating, fishing, birding, hunting and riding trails (BYO horse). In winter, there’s cross-country skiing, snowshoeing, ice fishing on Lake Jean, snowmobiling andice climbing up the falls. And when the park closes for the evening, or you’re simply tired of hoofing it? There’s plenty of other ways to spend a few happy hours in the area. Antiquing, wine tasting, eating good food — it’s all part of the package. Columbia County also is known for its many covered bridges. Getting there: Ricketts Glen State Park is in Benton,Columbia County, in the northeastern part of Pennsylvania. From Pittsburgh, the 250-mile drive takes about 4 hours via State College and Bloomsburg. Park hours are sunrise to sunset, year-round. Free parking and hiking maps are available throughout. Lodging: Hiking and camping go hand in hand, so the park is happy to oblige with 120 tent and trailer campsites, with access to hot showers and flush toilets; there also are 10 cabins for rent available year-round. Prices start at $19 for a tent site that can accommodate up to a 30-foot trailer; cabins cost $118 for a 2-night minimum (7-day minimum during the peak summer season) and feature electric heat, water, flush toilets, showers and small kitchens (www.pa.reserveworld.com; 1-888-727-2757). If your idea of a good night’s sleep instead includes mattresses, linens and indoor plumbing, there are almost two dozen motels and hotels to choose from within a half-hour drive of the park, including the Econo Lodge and Holiday Inn Express at Bloomsburg. From $80/night. Ricketts Glen Hotel (rickettsglenhotel.net), one mile west of the park on Route 118, has rooms starting at $49.95 (single with shared bath) and $61.05 (double with shared bath). For bed-and-breakfast types, there are a dozen within easy driving distance of the park, including the stellar Inn at Turkey Hill in Bloomsburg (innatturkeyhill.com; 1-570-387-1500). The most luxurious rooms include two-person whirlpool baths, and all come with a gourmetbreakfast ($128 and up.) There’s also fine dining on site and the Turkey Hill Brewing Co. pub next door. If you enjoy rural settings, the uber-romantic Pump House B&B outside of Bloomsburg will delight with its lovely creek-side rooms outfitted with antiques, tin ceilings and exquisite spot-on renovation merited a feature on “This Old House.” $125 and up. Eat, drink and be merry: There aren’t scores of restaurants to choose from in and around Ricketts Glen State Park, but it’s still possible to get a good meal. The Ricketts Glen Hoteloffers upscale American and Italian specialties at reasonable prices. The Old Filling Stationin Benton (140 Main St., 1-570-925-6556) also comes highly recommended by locals, as does the Texas-style barbecue at Smoke House Barb-B-Que (225 Center St., 1-570-925-6962).Strevig’s Family Restaurant (4438 Red Rock Road, 1-570-925-0330) has traditional American fare. I had surprisingly good spring rolls and spicy Pa-Nang Mango with Prawns atBloomn’ Thai, a private dining club in Bloomsburg (442 East St.; a lifetime membership costs $1). Ready Go Burrito (102 E. Main St.) has wraps and burgers in addition to awesome (and cheap) tacos and quesadillas. Activities: In addition to 26 miles of hiking trails that vary in difficulty from very easy (Evergreen Trail) to difficult (Falls Trail), the park offers fishing and boating on 245-acre Lake Jean. Other ways to spend the day include antiquing, shopping for seasonal goodies at local farm stands and tastings at several wineries, including Colonel Ricketts Hard Cider Winery in Benton. Columbia County also is famous for its 25 covered bridges. The 33rd annual Covered Bridge Festival runs Oct. 2-5 and includes more than 350 craft vendors, food, live entertainment, rides and a quilt raffle. Free admission. During the festival, a guided bus tour of various bridges costs $15. The annual Bloomsburg Fair (bloomsburgfair.com; 570-784-4949), one of the largest ag fairs east of the Mississippi, draws hundreds of thousands of people each year for headline entertainment, food, rides, crafts, horse racing and agricultural exhibits. This year’s 159th fair runs Sept. 20-27; $8 admission. Columbia County information: www.itourcolumbiamontour.com or 1-570-784-8279. PUT-IN-BAY, Ohio — The party starts early en route to Lake Erie’s South Bass Island. Minutes after the drive-on/drive-off ferry pulls away from the dock on Catawba Island a few miles west of Sandusky, Ohio, T-shirt-clad passengers on the lower deck start popping beer cans. Their grins are as broad as the sprawling green lake churning behind them. It doesn’t matter that the 3-mile journey to this tiny, picturesque island takes a mere 20 minutes. Or that it’s 10:30 in the morning. Something about Put-in-Bay village immediately puts people in a festive mood. “It’s wild,” a friend warned when she learned of my husband’s and my plans to weekend there. My son Jack, who’d been there a week before with his girlfriend’s family, was more utilitarian. “Good luck finding a room,” he said, a sage to the folly of trying to arrange a last-minute trip to the 4-mile-long island that draws 750,000 visitors a year. South Bass Island was settled in 1811. 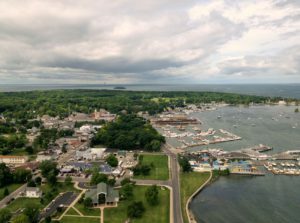 Boy, did the kid know something his folks didn’t: In Put-in-Bay, it’s near impossible during the summer season to find lodging on a weekend less than two weeks out unless you’re willing to pitch a tent at one of two camp sites. It was only through calling Put in Bay Reservations (1-888-742-7829) in hopes of snagging a cancellation that we accidentally found a bed. The guy who answered the phone happened to have a sister who’d recently opened up a holistic B&B called Freshwater Retreat who might have a room. We were in luck, and the 1880s Victorian home was so charming ($110 weekdays and $195 weekends), we didn’t much mind the fact it was across the street from the airport. 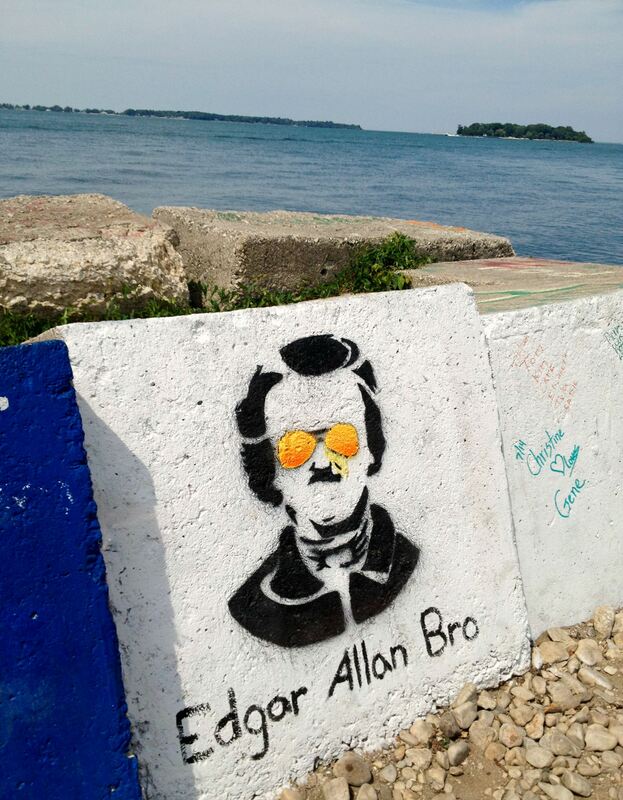 Thus another important lesson of Put-in-Bay: Relax and go with the flow. Upon disembarking the ferry at Lime Kiln Dock, there was a mad rush to the various shops renting golf carts. This being a Saturday, and the fact that the two-, four- and six-seat buggies are the preferred method of transportation here, you were pretty much outta luck if, like us, you hadn’t thought to make a reservation. We had, though, remembered to bring our bikes. So after strapping our gym bags onto our backs, we simply peddled a mile up the road to our B&B. Knowing our afternoon would likely include cocktails, we opted to catch one of the buses ($2.50) that make continual loops from the ferry into town. We hadn’t been waiting more than a few minutes when, without even sticking out our thumbs, we were picked up by Howard and Elaine, a friendly older couple in a golf cart who were putt-putting their way to the post office. Long-time summer residents, they told us to make sure to grab a bowl of lobster bisque at The Boardwalk and pointed out the best place to stay next time we were in town: The Bayshore Resort, the island’s only waterfront hotel. Put-in-Bay is billed as family-friendly, but I’d steer clear of bringing kids on the weekends when partying millennials fill the streets. Watching the crowd from our sidewalk table at Put-in-Bay Brewing Co., a charming open-air brewpub on Catawba Avenue, we noticed many start their buzz in early afternoon. And the revelry continues late into the wee hours, thanks to a profusion of bars and clubs fueled by surprisingly good live music. Our waitress pointed to a second-floor nightclub across the street as an example. “They really work up a sweat dancing there at night,” she said. Bachelorette parties, in particular, seem to be a Big Thing here — We saw scores of girls wearing crowns and accompanying “I’m the Bride” sashes followed by giggling, tipsy entourages. But first things first. Traveling makes you hungry. You can’t do PIB justice without sampling the catch its fishing grounds are famous for: fresh walleye or perch from Lake Erie. 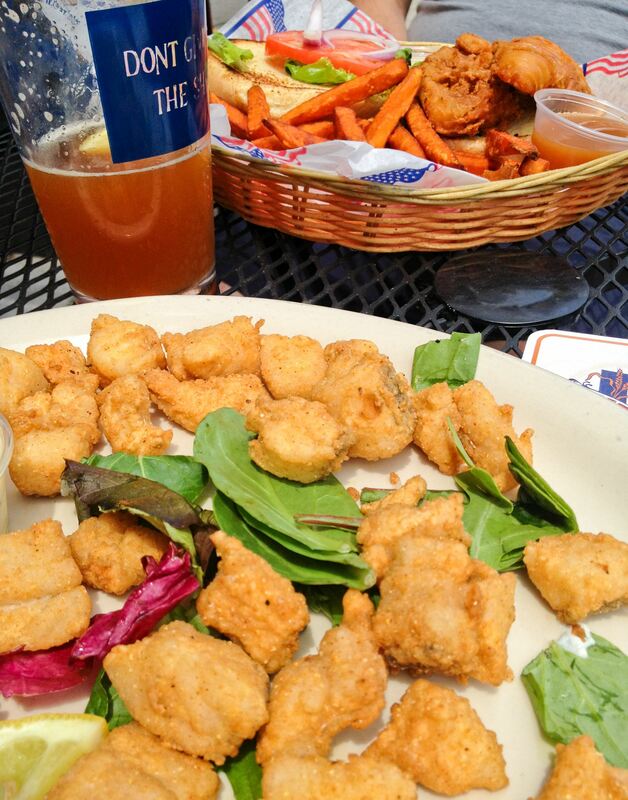 We had fried versions of both (plus some excellent house brews) at the brewery. Then we ambled down to the busy harbor past beachy boutiques and souvenir shops, a thatched-roof tiki bar and DeRivera Park, founded in 1866 to maintain green space along the water. Bayview Drive, the main drag, was alive with golf carts. 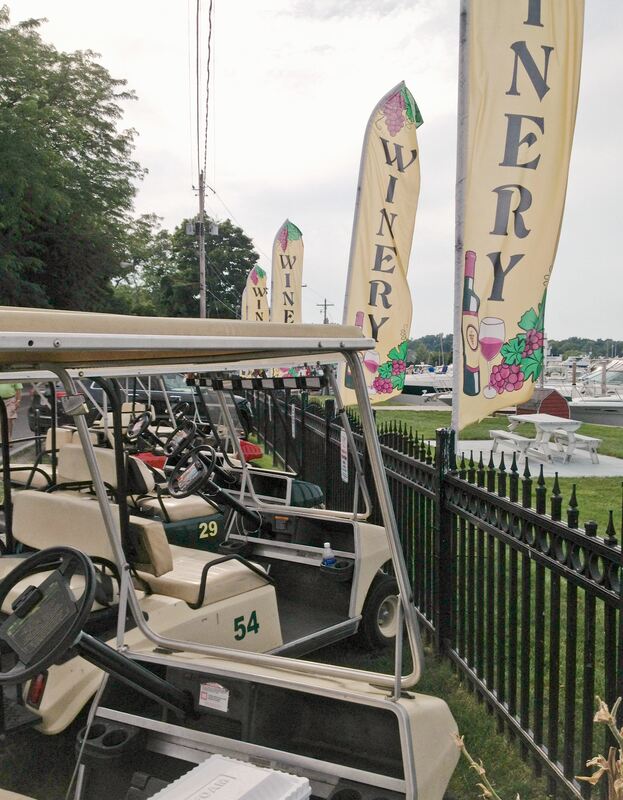 Many were parked in front of Put-in-Bay Winery. Of course we had to have a look-see and soon were enjoying a glass of Commodore Perry Chardonnay on the pretty Italianate front porch of the Doller House Estate, where the winery set up shop five years ago. Not wanting to play favorites, we managed a visit the next day to Heineman Winery. Established in 1888, it’s now in its fifth generation of family winemakers — six if you count a baby that’s just been born — making it the oldest family-run winery in Ohio. It presses about 40,000 gallons of wine a year from grapes grown on 40 island acres, some from vines that are 100 years old. Limestone-based soil and a longer growing season made possible by the warming of shallow Lake Erie help grapes do well here: In 1900 there were 17 wineries on the island. But as our guide noted while pointing out the winery’s 100-year-old wood barrels, Prohibition put most out of business in 1919. The samples, served in plastic cups and enjoyed at a picnic table in the sunny wine garden, were tasty enough. 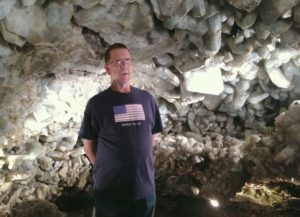 But what really made the trip a hoot was a visit 42 steps down beneath the winery to Crystal Cave. Billed as the largest geode in the world, the cave was discovered in 1897 when workers were digging a well. Many of the celestite crystals comprising the tiny cave (it holds about five people) were sold years ago for fireworks, but what remains is awesome. They range in size from golf balls to basketballs. Equally awesome in a totally different way was The Roundhouse. After scoring a seat at its circular bar, we spent a long and happy Saturday evening there listening to a great party band from Philadelphia. Opened as a restaurant famous for its ice cream and cottage cheese in 1873, it’s one of the island’s most popular (and boisterous) watering holes. People are said to wait all winter for the neon whiskey sign in the window to blink on each spring and not just because you can buy a bucket of 12 or 13 beers for just $37.50. It’s just so cool inside with its red, white and blue canopy ceiling. We also made a pit stop at Beer Barrel Saloon just down the block. At 405 feet, it’s said to have the longest bar in the world, with 160 bar stools and 56 beer taps. On a busy night, it can hold 1,200 people, requiring 20 bartenders. It’s a crazy place. Sunday’s pleasures included a splash in one of the island’s many pool bars and a wonderful dinner at the highly recommended Goat Soup & Whiskey. The walleye tacos were outstanding. Not looking to get soused? The island has a quieter side, which we discovered during several bike rides. Looking for a patch of sand in which to run our toes (for an island, PIB is weirdly absent of beaches), we pedaled out to Sheeff East Point Nature Preserve, a 9-acre preserve at the eastern end of the island with walking trails. Unaware of the recent algae bloom that made water undrinkable in Toledo, I waded into Lake Erie while my husband skipped rocks. It was lovely. We then took the short ferry ride to Middle Bass Island, which someone told us was less touristy than PIB. It was too quiet. So after a beer and swim at JF Walleye’s, we headed right back. We also took a ranger-led tour to the top of Perry’s Victory and International Peace Memorial. Built between 1912-15 to honor those who fought in the Battle of Lake Erie, it rises 352 feet. It’s taller even than the Statue of Liberty and the view from the top is nothing short of gorgeous. Then it was back into the craziness. 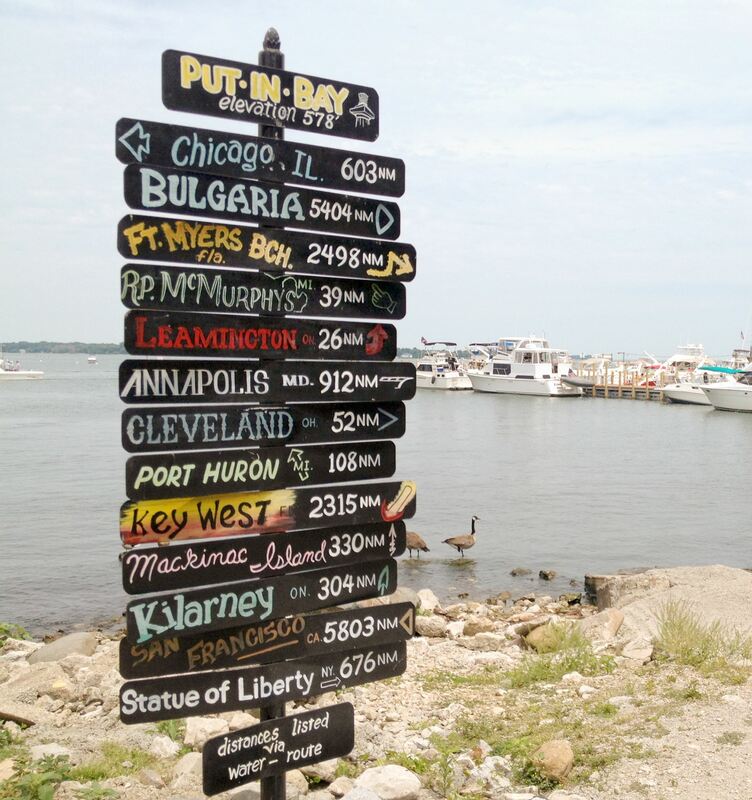 Getting there: Located on Lake Erie’s South Bass Island, Put-in-Bay village is a short ferry ride from Port Clinton, Ohio. From Pittsburgh, the 195-mile drive via the Ohio Turnpike takes about 3 hours. From the dock, it’s a short trip across Lake Erie via two ferries: Jet Express (jet-express.com, 1-800-245-1538) costs $17.50 one way (or $19.75 from Sandusky) and $4.50 per bike. Parking is $12/day to park in the main lot or $10 (one time in/out) in a lot one block away. Miller Ferry from Catawba Island (millerferry.com) costs $7 one way, $2 per bike and $15 for cars. Limited free parking; if it’s full, an auxiliary lot costs $5/day. If you’re really in a hurry, flights also are available from airports in Sandusky and Port Clinton; if you absolutely must bring your car (while permitted, it’s highly discouraged because parking is limited), you can use the Miller Ferry for an extra $15. Once on island, golf carts are the preferred method of transportation. Prices range from $11-$17/hour for a 2-, 4- or 6-passenger cart, or $70-$90 per day. An overnight, weekend or holiday rental adds $10 to the bill. Reservations are recommended, especially on weekends. You also can rent bikes ($5/hour or $15/day) and mopeds ($15/hour or $60/day). For those not in a hurry, buses run all over the island late into the evening ($2.50 per ride), and there are also taxis, which charge a flat rate of $3 per person. Accommodations: Do you want to be smack in the middle of the action or somewhere quiet? Relaxing in luxury or happy just with the basics? 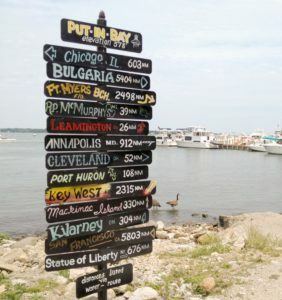 Put-in-Bay has everything from economy hotels and full-service resorts to charming B&Bs and rustic state campgrounds. During the season (April through late October), there also are more than 100 homes available to rent. Note: Rooms can be nearly impossible to find on weekends without a reservation, so plan accordingly. Eat/Drink: The lobster bisque, served in a giant bread bowl, is legendary at The Boardwalk on Bayview Avenue (www.the-boardwalk.com). So is the chicken at Chicken Patio next to the Roundhouse (a bar with excellent live bands). The chicken is grilled over a 21-foot open pit and slathered with wine-based barbecue sauce. We also very much enjoyed the homemade soup and walleye tacos at Goat Soup & Whiskey and had a fine breakfast at Blue Luna Ristorante. The Frosty Bar is a traditional beer/pizza joint on the water. Wanna drink while you swim? Mist at The Commodore Resort and Splash! at the Islander Inn have huge swim-up bars, while the Flaming Skull serves drinks from the deck of a fighting galleon replica. More reserved are the island’s two wineries: the posh waterfront Put-in-Bay Winery on Bayview Avenue and the laid-back Heineman Winery, founded in 1888 and home to Crystal Cave, billed as the world’s largest geode. Tastings there come in plastic cups. What to do: Waterbugs can rent kayaks, wave runners, power boats or go parasailing. There’s also a 9-hole par-3 golf course ($10 or $20 with clubs), boutiques and souvenir shopping and the limestone Perry’s Cave to explore ($8) — two caves, actually, if you count the tiny Crystal Cave at Heineman Winery ($7, including a tour of the winery and a glass of wine). For history lovers, there’s an antique car museum, a historical museum and Perry’s Victory and International Peace Memorial, built in honor of Oliver Hazard Perry, who defeated the British in a naval battle on Lake Erie in the War of 1812. 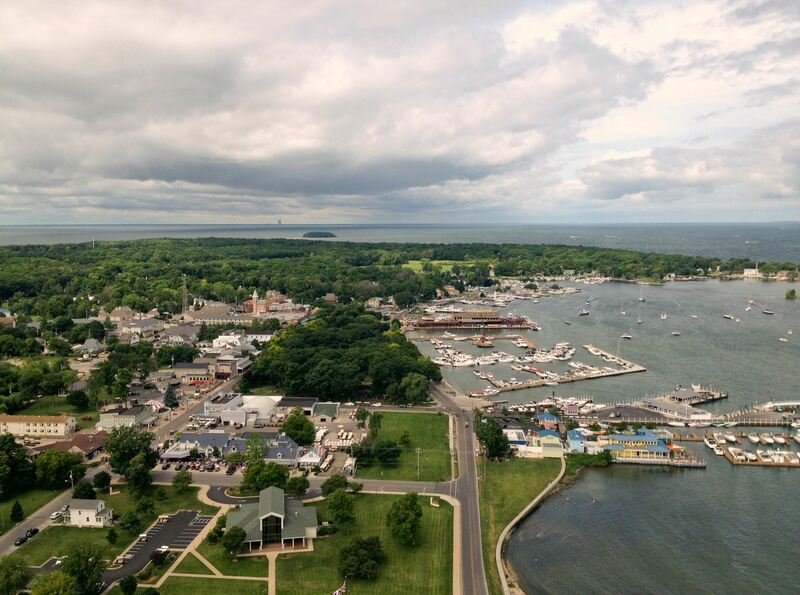 From the top, there’s a spectacular view of Put-in-Bay 317 feet below and over the water of the Lake Erie islands ($3). Kids will have fun on the 1917 Herschel antique carousel ($1.50) and Perry’s Cave Family Fun Center. ST. PAUL, Minn. — The smell washes over you in the parking lot, even before you reach the long lines that snake out in every direction at the ticket booth. The sweet, sugary aroma of cotton candy mixed with the earthy scent of manure. Weird, but also strangely appropriate. 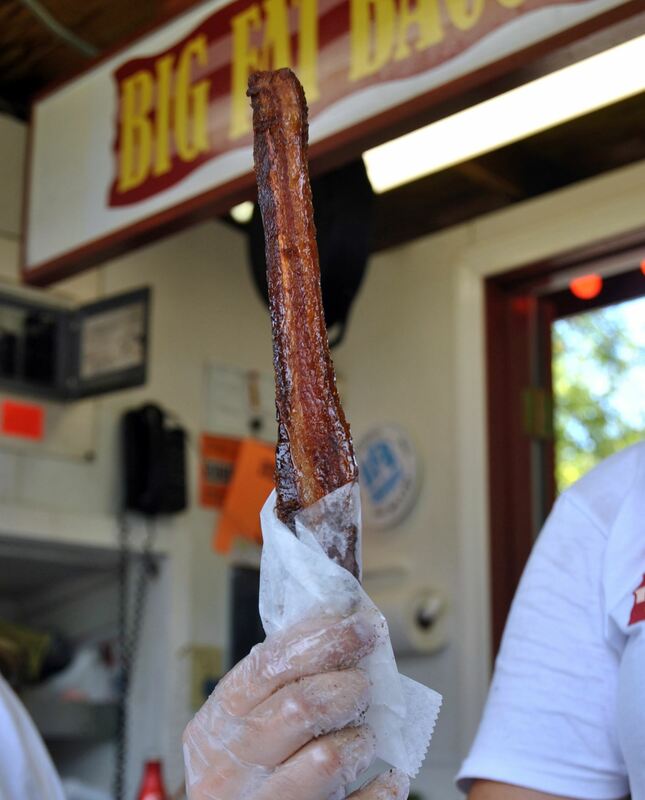 This is a state fair, after all, where horses, swine and cows share the spotlight with deep-fried foods on a stick. And not just any state fair, but one of the largest and best-attended expositions in the world. The Minnesota State Fair draws nearly 2 million people each year. Known as the Great Minnesota Get-Together, it’s the second-largest state fair in the country after Texas, though if you measure by daily attendance, it actually blows that gathering out of the water (Texas runs longer). It’s held each year the 12 days leading up to and through Labor Day. Many come to this city on the banks of the Mississippi River for the fair’s agricultural and animal exhibits, including the CHS Miracle of Birth Center, where nearly 200 calves, lambs, goats and piglets will be born in front of curious eyes during the 12-day event. There’s also a daily parade, free entertainment, a huge horse show, talent competitions, games of chance and dozens of rides at the fair’s Midway. Yet it’s also heaven for foodies, especially if you like your fair eats battered up and deep-fried. There are more than 450 different dishes served at some 350 food stands and concessions. Even after eight hours on foot exploring, it was impossible for me to take it all in, let alone sample all the fair has to offer. Sweet or savory, hot or cold, you can start with breakfast and easily work your way through lunch and dinner to a bedtime snack, sometimes on the same street in the fairgrounds, which stretches 320 acres. At least 60 of those foods are served on a stick, even when doing so seems to defy the law of physics and logic. Chocolate-dipped key lime pie or deep-fried apple pie on a skewer? Child’s play! Here, almost anything that can be shaped, smooshed, wrapped or stacked onto a stick is, including meat loaf, pizza, meatballs and spaghetti, fish, lamb and pork chops, teriyaki ostrich, bratwurst and cream cheese wontons. Oh, and giant, golden-brown Scotch eggs and tater tots interspersed with meatballs. Among the 28 new foods this year are deep-fried Canadian lobster on a stick, pretzel curds and battered and deep-fried buckeyes, which made the deep-fried Twinkies and candy bars served next door seem oh-so-2003. I also watched an elderly woman wolf down a crispy creation called the Deep-Fried Breakfast-on-a-Stick. It’s hard to imagine a more caloric way to start your day, but she dug into the batter-fried pancakes stuffed with sausage, egg, Swiss and American cheeses and Canadian bacon with absolute abandon. The variety is overwhelming and the portions are huge, suited more for sharing than scarfing on your own. However, solo is how most of the people I observed seemed to be enjoying the decadent, high-cal treats, save for the giant buckets of soft and gooey chocolate chip cookies that accounted for $2.4 million in sales at last year’s fair. They’re the No. 1 food, followed by corn dogs, ice cream and deep-fried cheese curds. “Smaller portions so people could graze all day would be nice, but it just doesn’t work that way,” acknowledges Dennis Larson, who’s in charge of the fair’s vendors and new foods. Unlike other big fairs, Mr. Larson says, Minnesota doesn’t go after the “shock foods” that verge on the ridiculous — say, the beef sundae served in Indiana or the fried butter balls that made Montana famous. Rather, the vendor committee looks for fun food that has “legs” that will stand up to Minnesotans’ persnickety taste buds. “Sometimes it’s a slippery slope, but we try to strike a balance” between shock and awe. 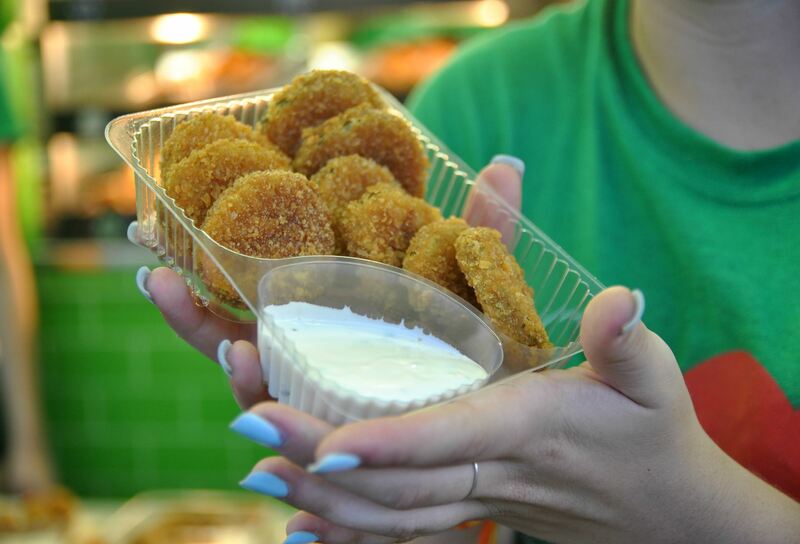 Foods that have a “how do they do it” or “why do they do it” appeal — deep-fried mac ’n cheese comes to mind — tend to slow the crowd down when no one wants to stand in line for more than a few minutes. Not everything plays well in the Midwest, Mr. Larson explains. For instance, Rocky Mountain oysters wouldn’t fly here and crowds also weren’t too crazy about a camel-on-a-stick dish offered a few years ago. “We also had a batter-dipped, deep-fried sweet corn that went away,” Mr. Larson says. That said, guests in the past have enjoyed such oddities as deep-fried soda and bubble gum, and officials are seriously considering a filet of yak dish when a spot opens up (vendors have to reapply for a 12-day license each year). Back in the day, many meals were eaten Sunday supper-style in the fair’s old-fashioned, sit-down Robbinsdale and Hamline Church dining halls The oldest food concession at the fair — it started as a lunch site in 1897 — Hamline this year trotted out one of the fair’s best new sweet treats, jello salad- and doughnut-flavored ice creams. Today’s crowd, Mr. Larson notes, wants their food quick, fun and most of all, completely portable. Which might explain the lines in front of the Big Fat Bacon (on a stick) and Pickle Dog booths. For the uninitiated, that’s a dill pickle spear wrapped in cream cheese-slathered pastrami. If you really want to eat like a Minnesotan, Sarah Harris, a 20-something I struck up a conversation with while I was charging my cell phone, says you have to try lefse, a thin flat potato pancake with Norwegian roots. Similar in looks to flour tortillas, the flatbreads are served warm from the oven, rolled up with your choice of butter, sugarand/or cinnamon. Simple, but delicious — and one of the few things on site that’s not fried, she notes with a laugh. “And you have to eat walleye,” added her friend, Mateo Willson, referring to the prized freshwater fish with thick, white fillets that populates the state’s many lakes. I’d seen the signs. The popular fish is served at least three ways at the fair — battered and deep fried on a stick, stuffed with lettuce and cheese into tacos, or, new this year, mixed with sweet corn kernels and roasted red peppers and served atop cavatappi noodles with smoked Gouda sauce. Too rich for my taste. But I did rather enjoy the buttered lefse and another very Minnesota treat — the $1 all-you-can-drink cup of white or chocolate milk. Other local treats included bags of miniature doughnuts, which Mr. Larsen tells me were invented in Minnesota in the early 1940s and nearly as popular as the ubiquitous buckets of chocolate chip cookies. Over one night and one day, I also enjoyed a Caribbean-style lobster roll (just OK), deep-fried corn fritters stuffed with crumbled blue cheese and served with tangy chimichurri (excellent, and so big I had leftovers for breakfast), beer gelato made with oatmeal stout (also excellent) and a prime rib taco (yum). I’d been looking forward to a fantastic-looking chicken in a waffle, too (slathered in sausage gravy, with a malted milk ball in the bottom of the cone), and maybe also a hot-toasted waffle ice cream sandwich. But a sampling of four Minnesota craft beers at the Land of 10,000 Beers’ Craft Beer Hall exhibit followed by a ride high above the crowds in the fair’s 50-year-old Swiss-made Skyride had me feeling kind of queasy. Dang. After surveying the fair’s online food finder, I’d also meant to try to deep-fried banana split made with lefse, and a new, feathery, cotton candy-like concoction of shaved ice cream called SnoRibbons. The server at the Blue Moon Dine-in Theater promised it would melt in my mouth, providing sweet relief not just from the late-August heat but also the hubbub of the crowd swirling around me. Clutching my too-full stomach, I settled for a bite-sized sample. Getting there: The Minnesota State Fair is located about halfway betweenMinneapolis and St. Paul, at the state fair grounds at 1265 Snelling Ave. North. From downtown Minneapolis, it’s about a 20-minute express bus ride on Route 960 ($1.75 each way). If you drive, on-site parking will cost you $13 (cash only). There’s also three free monitored bike lots for cyclers. Cost/hours: The fair is always held the 12 days leading up to and through Labor Day; the 2014 Minnesota State Fair runs from Aug. 21 to Sept. 1. Entrance is $13 daily for adults and $11 for seniors and kids ages 5 to 12. Ages 4 and under get in free. The fairgrounds are open daily from 6 a.m. to midnight; guests must enter by 10 p.m.
Once you’re inside the gates: Events at the grandstand require additional tickets, and tickets to the Midway/Kidway rides cost $1 (or $25 for a sheet of 30 or $40 for a sheet of 54). There are more than 30 rides and 50games of skill; most rides require between four and six tickets. A Blue Ribbon Discount Book, which includes 150 tickets for discounts on food, merchandise and attractions, costs $5 and is available on site. Food: Most concessions run between $3 and $10 and typically are large enough to share. Water fountains are few, but beer, soda and other drinks flow readily. Special exhibits: The CHS Miracle of Birth Center is the birthplace of nearly 200 calves, lambs and piglets during the fairʼs 12-day run. Heritage Square features nostalgic arts, crafts and gifts, as well as the State Fair History Museum. The International Bazaar is filled with fun and flavors from around the world. And at the Dairy Building, you can see the fair princess and her court’s likenesses carved into 90-pound blocks of butter. The fair also features agricultural and livestockcompetitions. MOUNT JEWETT, Pa. — Even before its tattered remains were reimagined as a spectacular walkway over one of Pennsylvania’s prettiest gorges, the Kinzua Viaduct was one for the history books. When it rose some 300 feet above the ground more than a century ago, the structure was the largest and longest railroad bridge in the world — higher even than the world-famous Brooklyn Bridge. Built of wrought iron by Civil War general-turned-railroad tycoon Thomas Kane, the engineering marvel stretched 2,053 feet across the Kinzua Valley, making it easier for workers to transport coal, oil and lumberacross the region’s rugged terrain. Dubbed the “Eighth Wonder of the World” by its promoters, the bridge in 1900 was reconstructed to accommodate weightier, modern trains using 6 million-plus pounds of steel held together by 895,000 rivets, and for the next half century it reigned as McKean County’s industrial workhorse. Even when it was pulled from commercial duty in the late 1950s because trains had become too heavy, it still saw heavy traffic — from feet. 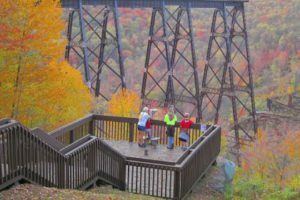 Locals and tourists alike loved walking its wooden ties across the Kinzua Gorge (it’s pronounced “Kin-ZOO,” with a silent “a”) and hiking the woods below. In 1987, years after the state purchased the bridge and created a state park around it, its tracks once again rang with the clang of steel on steel. The main attraction of the tourist Knox & Kane Railroad through Allegheny National Forest was a scenic, bouncy ride over the gorge. Those fun and games came to an abrupt end in 2002, when inspectors discovered extensive rust on the structure and shut it down for repairs that would never be completed. On July 21, 2003, a tornado with 100 mph winds and torrential downpours ripped through the valley, pulling hundreds of trees from their roots and tearing 11 of the bridge’s 20 towers off their foundations. Within 30 seconds, the middle two-thirds of the bridge lay twisted on the ground. When Mother Nature abruptly shuts one door, though, human ingenuity opens another. The wreckage of the former bridge — placed on the National Register of Historic Landmarks in 1977 — still lies tangled in the grass on the gorge floor. Yet what managed not to fall is today even more awe-inspiring. The nine remaining towers (six on the south end and three on the north) have been fashioned into a $4.3 million pedestrian walkway with a glass-bottomed observation deck that juts some 600 feet into the Kinzua Valley. It offers those who dare walk to the end spectacular views of the valley below. If you’re acrophobic, it can be a scary stroll in the sunshine, especially if you choose to walk on the spaced wooden ties of the railroad instead of the wooden deck that straddles it. But no worries: They’re not wide enough to slip through and a chest-high rail the length of the walkway means you won’t topple over, either. Since its grand opening two years ago, the skywalk has quickly become one of the area’s top tourist attractions, drawing more than 130,000 visitors each year. Hikers are officially prohibited from hiking down the hillside to the valley below, but not everyone follows the rules. Mr. Broad, for one, has made the half-hour climb numerous times in search of railroad spikes and lag bolts amid the wreckage. We opted to get a better view of the walkway from a small observation deck built into the hillside just off the parking lot. With miles of hiking trails nestled under the shade of old-growth trees, much of it alongside bubbling brooks, Allegheny National Forest is gorgeous any time of year. But it’s particularly lovely in fall, when the leaves on its many oak, maple and black cherry trees turn from candy yellow to candied-apple red, and roadside stands tempt with farm-fresh apples and bright-orange pumpkins. So fall is the perfect time to plan a visit to the Sky Walk, and then explore the small towns surrounding it. This year, the colors in northern Pennsylvania are expected to peak in mid-October. For a weekly fall foliage report, visit www.leafpeepers.com/pa.htm or call the visitPA hotline at 1-800-847-4872. Getting there: Kinzua Bridge State Park is just north of Mount Jewett in McKean County. It’s about 145 miles (and three hours) northeast of Pittsburgh. We took Interstate 79 North to Interstate 80 East to PA Route 66 north (exit 60) to U.S. 6 East through Kane. In Mount Jewett, take PA Route 3011 north into the park. Admission to the park (open daylight hours) and skywalk is free. Info: tinyurl.com/kinzuapa or 1-814-965-2646. Where to stay: Kane Manor Bed and Breakfast (kanemanor.com; $59 and up) has 11 guest rooms with period furnishings in a turn-of-the-century national historic landmark. Breakfast is served in the sunroom. In Westline, you’ll find brass beds, no TVs and tongue-and-groove wall paneling in the tiny Westline Inn’s simple rooms, but hey, there’s a really cool bar downstairs ($80 and up; westlineinn.com). The upscale Mansion District Inn in Smethport (mansiondistrictinn.com; $105 and up), located in a 19th-century Queen Anne-style Victorian mansion, offers both bed and breakfast rooms, and self-catered suites; its Sky Walk package ($276) includes a two-night stay with a gourmet breakfast each morning, a craft beer tasting and a bottle of wine upon arrival. Mountain Laurel Inn in Bradford, built in 1894, has seven guest rooms with private baths; some also have working fireplaces (mountainlaurelbradford.com; $85 and up). Require more fabulous digs? See the facing page to read about the Lodge at Glendorn in Bradford. Where to eat: We enjoyed terrific sandwiches and a decent craft beer selection at Corner Pizza Co. in Smethport (437 W. Main St.; 1-814-887-7755), and also had a great pork barbecue lunch in the Westline Inn’s cozy pub (1 Westline Road, Westline); starting at 5:30 p.m., there’s also fine American and French dining in the formal restaurant. Kaffe Sol, a charming Swedish cafe in Mount Jewett (1 West Main St.), serves delicious coffee, sandwiches, homemade breads (don’t leave without trying the sweet rolls or rye bread). Breakfast and lunch only. Also worth a try are the hot dogs or the souvlaki dinner at Texas Hot Lunch in Kane (24 Field St.), which has been in business since 1914. Beefeaters in Bradford (27 Congress St.) is known for, what else? — its ribboned roast beef. If you’re looking for a treat to take home, stop by Bell’s Meat Market in Kane (401 N. Fraley St.). This quaint country story sells 2,000 pounds of gourmet sausage each week, including alligator (from Louisiana and Florida), tasso and Korv (a Swedish pork sausage). Read more about Bell’s at post-gazette.com/food. Museums/Historic sites: Old house lovers will want to spend an hour or two exploring the Smethport Mansion District. During the town’s heyday in the late 1800s, vast fortunes from the gas, lumber and railroad industries flowed into this tiny community. Wealthy inhabitants built dozens of mansions and ornate public buildings, many of which have been restored. A self-guided walking tour brochure is atsmethportpa.org. There also are several museums to explore. The most famous is the Zippo/Case Museum in Bradford (free; 9 a.m.-5 p.m. Mon.-Sat. and 11 a.m.-4 p.m. Sun). Made popular by GIs during WWII, thousands of Zippo lighters and Case knives are displayed here. The Kane Depot & Train Museum at the junction of U.S. Route 6 and PA Route 66 (www.kanedepot.org; 11 a.m.-5 p.m. Sat.-Sun.) is a beautifully restored 1800s train station, with local Kane and train memorabilia. It also houses Art Works at the Depot, an artists’ cooperative gallery selling fine art and crafts from the region. Crook Farm Historical Farmstead in Bradford includes a fully restored 1847 farmhouse, schoolhouse, blacksmith and carpenter shops and a barn. It’s open by appointment only through September (1-814-362-3906 or bradfordlandmark.org). Even more strenuous — if you go the entire distance — is the 96.3-mile-long North Country National Scenic Trail. It’s the longest trail in the Allegheny National Forest. Hike it, and you’ll see vistas of the Allegheny Reservoir as it weaves through rock outcroppings, open hardwoods, old-growth forests and stands of hemlock. Fun and games: For a bird’s-eye view of the bridge and Allegheny National Forest, take a ride in the open cockpit of a vintage biplane. Pilot Bruce Klein of Klein Aircraft Services (1-814-642-9486 or brklein@hughes.net) will take you up in his restored 1943 Boeing Stearman. A 20-minute ride, which leaves from Bradford Regional Airport, costs $80. Rather relax on the links? Play 18 holes of golf atop the mountains at Kane Country Club in Kane. Just $30 Mon.-Thurs. 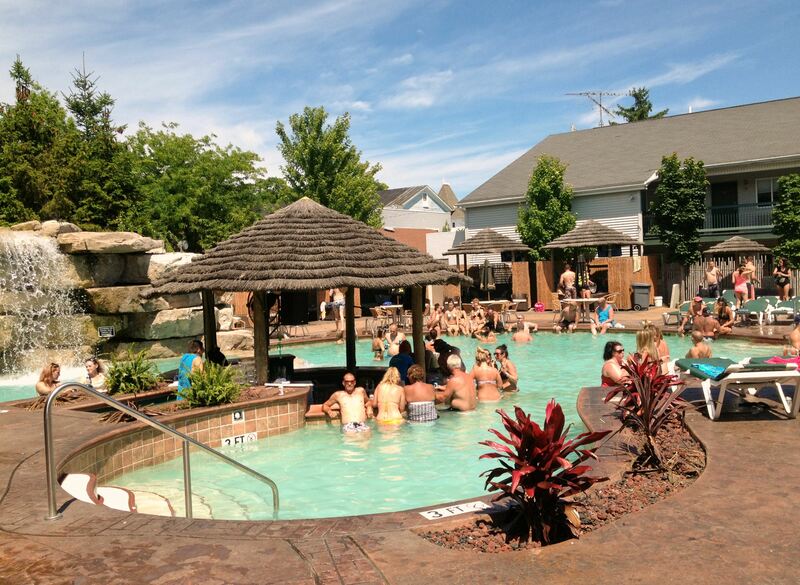 ($39 weekends) and that includes a cart (kanecountryclub.com). At Pine Acres Country Club in Bradford, you’ll pay $25 for 18 holes walking (pineacrescc.com). Tastings of local wine are offered at Flickerwood Wine Cellars in Kane (flickerwood.com), which has rockin’ live music on weekends, and Allegheny Cellars in Sheffield (alleghenycellars.com). It opened in 2007. 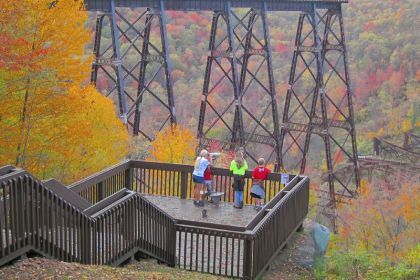 Festivals: The 18th annual Kinzua Bridge Festival runs from 10 a.m. to 6 p.m. Sept. 21-22 at the Sky Walk and includes live music, arts and crafts and food vendors. In a nod to local lore, there will be a Bigfoot calling contest at 3 p.m. Sept. 21. The elusive creature with the famously large feet is said to roam the wilds of Allegheny National Forest, prompting Animal Planet to film an episode of “Finding Bigfoot” in Kane last year. 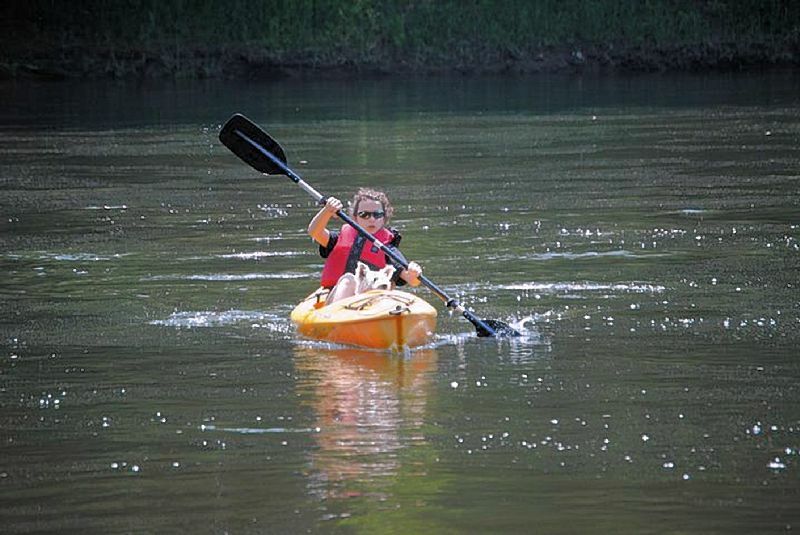 Paddling or tubing on the lazy Clarion River. Climbing the teetering, 87-foot fire tower built as a firemen’s lookout in 1929 and then scrambling across the rocky ledges at nearby Seneca Point Overlook. (You can see for miles at both locations.) There’s also the mandatory licking of hand-dipped Hershey’s ice cream cones at The Cooksburg Cafe on River Road, souvenir shopping at Parker’s Indian Trading Post, hiking, fishing, antiquing …. The list of family-oriented activities visitors have been enjoying for generations goes on and on. So the fact I’m sipping Pennsylvania-produced red wine on a Saturday afternoon at a sweet little winery deep in the woods comes as a happy surprise to this veteran Cook Forester. It’s a little surreal, even. I always thought Bud was the drink of choice among outdoor types. No way, says Kate Hall, who a year ago opened the tiny R• • Bandana Winery (redbandanawinery.com), at which my husband and I are drinking, after falling in love with and marrying a native. She laughs and says, “We have a lot of happy locals,” not to mention a “very strong following” of city slickers like me, who keep the winery’s cozy tasting room and back deck buzzing on weekends. Made with local organic grapes and fruit, R• • Bandana’s offerings include an assortment of reds, whites, fruit and berry wines. A tasting of four at the charming oak bar costs just a buck, but most customers enjoy it by the glass ($4.25-$6.50) or bottle ($9.99-$15.99). For non-drinkers, there’s a French press coffee bar, organic grape and cherry juices and bottled root beer, and you also can enjoy cheeses from Pennsylvania Macaroni in the Strip District. By the door, there’s a selection of premium cigars. Actually, there’s a lot of wine drinking these days in these parts of Pennsylvania. At least a half-dozen wineries selling a variety of sweet, dry and fruit wines are within easy driving distance of Cook Forest, and all offer tours and tastings — a perfect diversion when you’ve overdosed on nature or the weather’s not cooperating. To name a few: Deer Creek Winery in Shippenville specializes in raspberry wines, while Allegheny Cellars Winery in Sheffield makes an award-winning sweet Concord red. Rather spice the tongue? Laurel Mount Vineyard in Falls Creek has among its offerings Groundhog Grog, an apple wine spiced with cinnamon and nutmeg. For one-stop tasting, all of the above, plus several more, will be part of the fourth annual Wine Fest in the Forest on Aug. 17 at Majestic Farms & Hall in Leeper. Tickets cost $20 in advance at cookforest.org or $25 at the door, and attendees also will get to sample chocolates from Dan Smith’s Candies, along with a variety of cheeses. This year’s event also will include a dozen vendors selling everything from jewelry and rustic furniture to homemade jellies and dips. If you’re expecting a snooty, highbrow wine experience, you may be disappointed on a visit to R• • Bandana. Built with salvaged materials from Construction Junction and decorated with tanned hides and an eclectic but comfortable mishmash of thrift-store finds, this is a pretty laid-back place. And that’s before you discover a side room filled with hats and costumes so customers can play dress-up when the mood strikes. 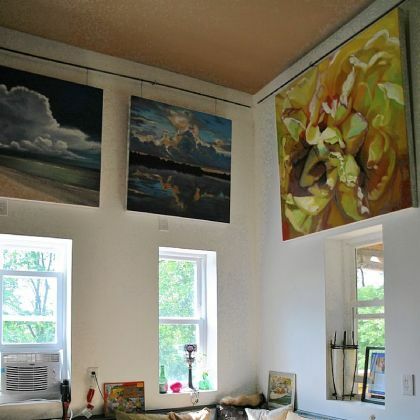 A professional artist who trained and taught at Carnegie Mellon University, Ms. Hall has been visiting Clarion County since she was a toddler; she grew up in Bethel Park and for a while had a gallery on Pittsburgh’s North Side. But it wasn’t until she met husband-to-be Mike, who works in the gas industry, that she came up with the idea to combine art with winemaking. They were inspired, she says, by their trips to Lake Erie’s wine country. Securing financing through The Progress Fund and constructing, with local labor and timber, the winery, which sits on 22 acres across the road from her mother’s 1870s farmhouse, took three years. It was a hit from the get-go. That “something” includes offbeat activities such as an upcoming Crappy Car Cruise on Aug. 10 and a swing dance the night of the wine festival benefiting the Clarion Area Trail Towns Co-Op ($18 in advance, $25 at the door). The winery also has live entertainment on Fridays and Saturdays, “and we get really good bands,” such as Tom Zeller’s Jazz Lite Quartet from Clarion, which rocked the house July 6, and local artist Robyn Culp Young. Expect also to be greeted by the Halls’ Shetland sheepdog, Olivia, who, like the bandana-wearing West Virginia coal miners of old for which the winery is named, wears a bright red handkerchief. “You come as a stranger and leave as a friend,” she says. The winery is open from noon to 7 p.m. Thursdays, noon to 9 p.m. Fridays and Saturdays and noon to 5 p.m. Sundays. Cooksburg/Cook Forest is two hours by highway if you don’t get stuck in summer construction on Interstate 80. Take I-79 North to I-80 East and get off at Exit 60 toward Shippenville. Follow Route 66 North 15 miles to the light at Route 36; turn right on Route 36 South and go 7 miles to the park. There are campsites galore near Cooksburg, as well as private cabin rentals in the woods and on the water. In addition, Cook Forest State Park (1-814-744-840; dcnr.state.pa.us) has 210 camping spaces (some ADA accessible) plus 18 rustic cabins (outdoor plumbing and bathrooms) that sleep four to eight people. The Inn at Cook Forest, a Victorian farmhouse built as a Cook homestead in 1870 (theinnatcookforest.com), is the area’s premier bed and breakfast. Across the street from the river, with a picturesque covered porch, it features nine rooms (some with antique furniture and river views) and a gourmet breakfast each morning. Prices range from $100 with a shared bath to $130 for the king-sized Cook suite with a fireplace. More upscale is the Gateway Lodge (gatewaylodge.com), which has luxury suites with king beds and private balconies ($199 and up) in addition to eight original rooms furnished with antiques ($95 and up). Cook Forest State Park’s grove of old-growth white pines and hemlocks, called the Forest Cathedral, is one of the largest stands of old-growth timber in the state. 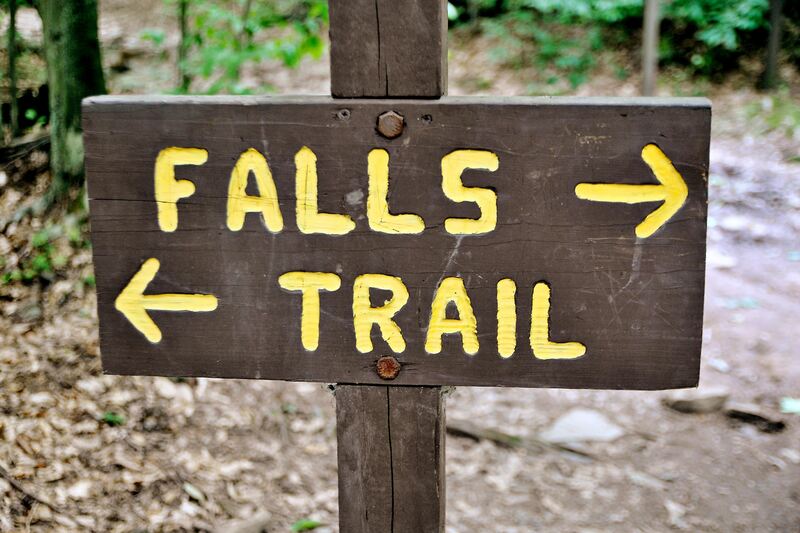 It’s great for hiking; also be sure to check out the fire tower and Seneca Rocks. If you’d rather play in the Clarion River, several companies rent canoes, kayaks and inner tubes, including The Pale Whale (cookriverside.com) and Cook Forest Canoe Rental (cookforestcanoe.com). The Verna Leith Sawmill Theater at the Sawmill Center for the Arts (sawmill.org) offers local productions of plays and musicals throughout the summer. If you believe one man’s trash is another’s treasure, the flea market behind Leeper Market (free, intersection of Routes 36 and 66 in Leeper) can be fun. It can have upward of 30 venders selling knickknacks, clothing and household items on a busy weekend, and there’s also a concession stand with homemade french fries. At least one Amish family usually is selling homemade jellies, pickles, pies and bread. If you happen to be in the area the first weekend of the month, worth the half-hour drive is the flea market in nearby Hazen, just north of Brookville on Route 28. It’s huge (and exhausting), featuring more than 300 vendors. There are also several antique stores on Route 36; be sure to check out Mountain Mercantile. Just because you’re in the woods doesn’t mean you won’t eat well. The Gateway Lodge has gourmet farm-to-table dining both at dinner and breakfast. The Forest Nook features burgers and Italian food, and it also has a great deck for outdoor dining. Knotty Pines has sandwiches, nachos and an outdoor tiki bar. For terrific pizza, try Fox’s Pizza Den in Tylersburg. And ice cream? Some of the best soft-serve in the state can be found at the Sawmill on Route 66 in Leeper, across the road from Leeper Market. For more info: cookforest.com, dcnr.state.pa.us or VisitPaGo.com.